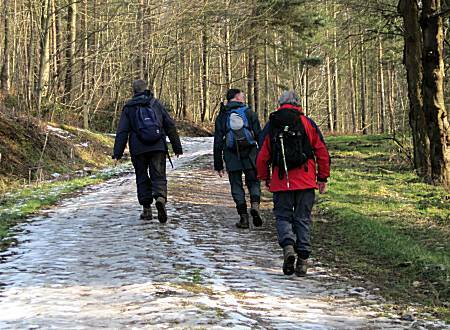 Seven walkers arrived at the top of Sutton Bank in very snowy conditions, parking in the visitor centre's car park and willingly paying the £4 per car charge. 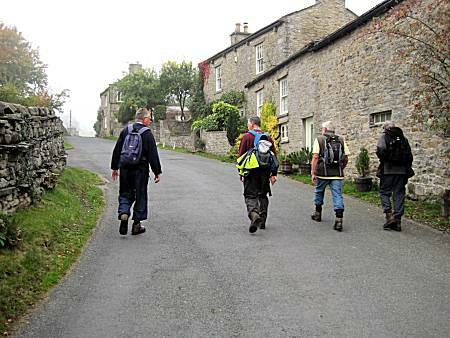 Ron's bacon, sausage and egg butties were quickly devoured, before they endeavoured to set off on their difficult walk. 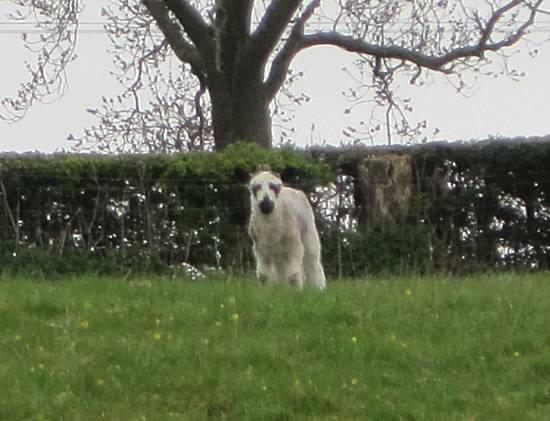 However, they were immediately approached by a local with her dog, who advised of the distress caused to their community by the snow and in particular the loss of their 'White Horse'. 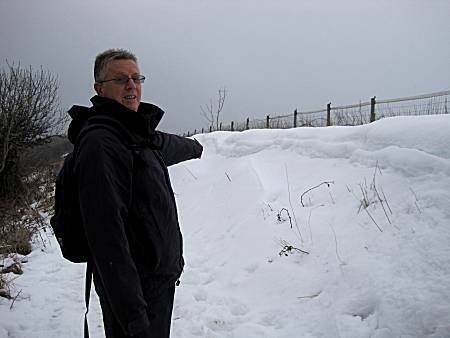 The walkers quickly found the problem with deep drifts of snow obscuring the entire area. 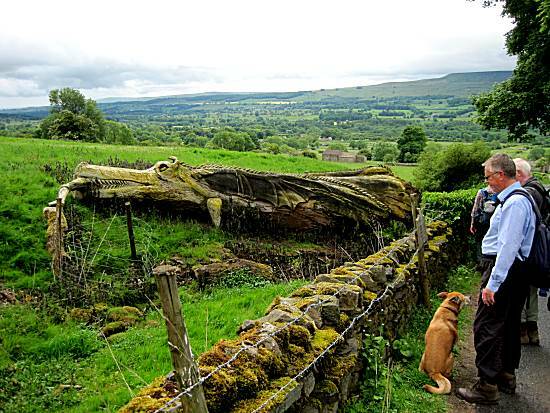 They knew that the 'White Horse' must be hidden nearby and vowed to find and uncover it.. 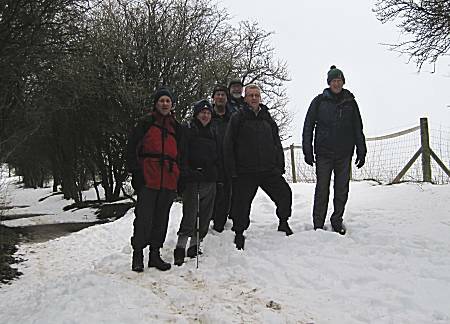 The walkers wasted no time in clearing all the snow from the footpath, but were unable to locate the White Horse. After much hard work only a little snow remained, but still they failed to locate the White Horse. 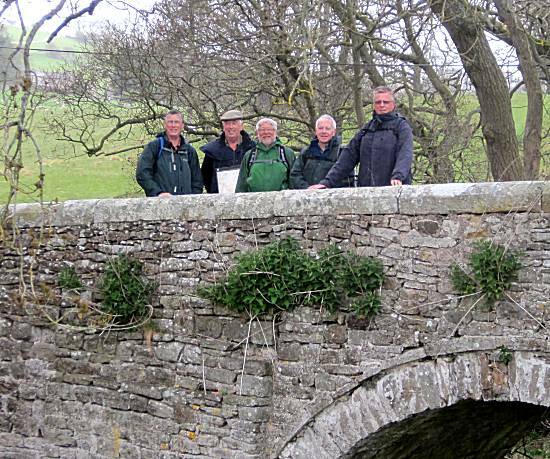 Cunningly the walkers searched out all the bridges, but the White Horse was not found underneath any of them!! 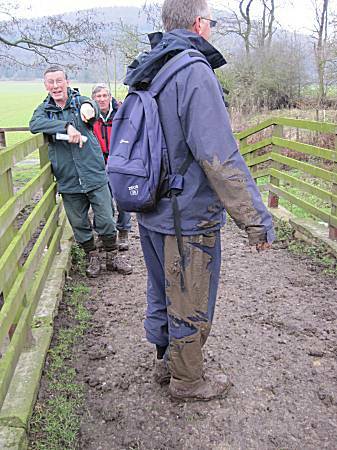 When Ron fell in the mud, whilst desperately digging to find the White Horse, but the other walkers were unconcerned. 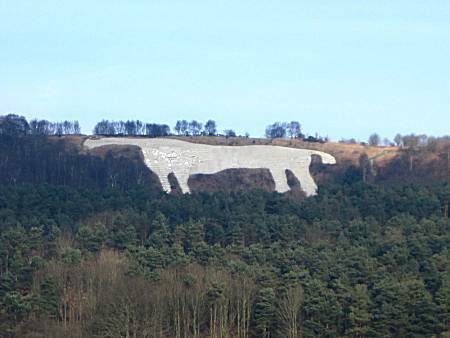 After hours of hard digging, the Walkers eventually located the White Horse, quickly removing all the snow and placing it back in it's correct position, much to the eternal gratitude of the Local's. 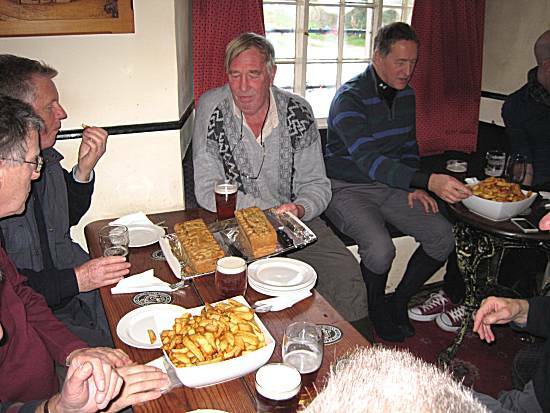 After the successes of their day, the walkers quickly headed to the Forresters Arms in Kilburn, where the locals had produced a special 'White Horse Ale' in their honour. Initially they sat outside in the now surprisingly warm conditions. 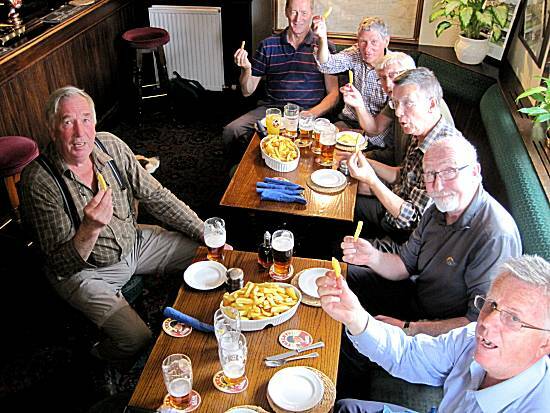 They ordered two giant bowls of perfect chips at a bargain price, which were thoroughly enjoyed by the walkers. Chip Score: 2 generous bowls of good quality chips at a bargain price. 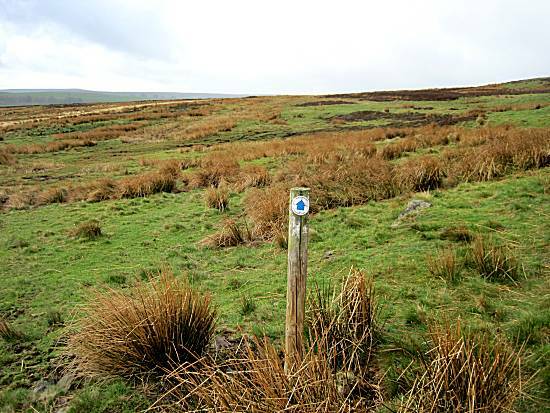 Weather: Snow on the tops, turning into pleasant and surprising warm, but muddy day. 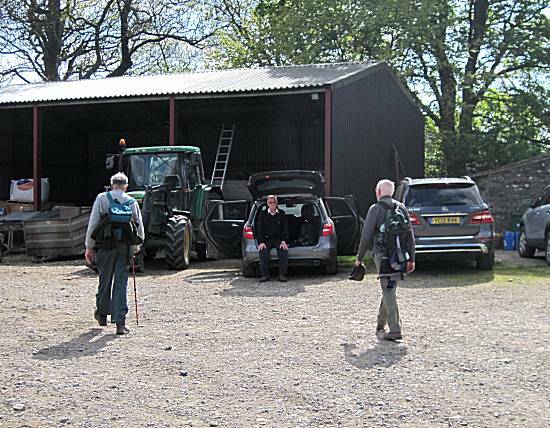 Seven walkers arrived at the car park opposite the Leyburn Auction Mart eager to devour Ron's excellent egg, bacon & sausage butties. 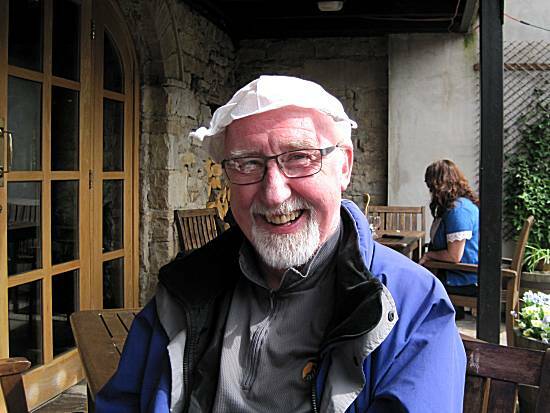 Although Cliff was not in attendance, rumours existed that he might make a surprise arrival somewhere on the walk. The walkers were intrigued!! 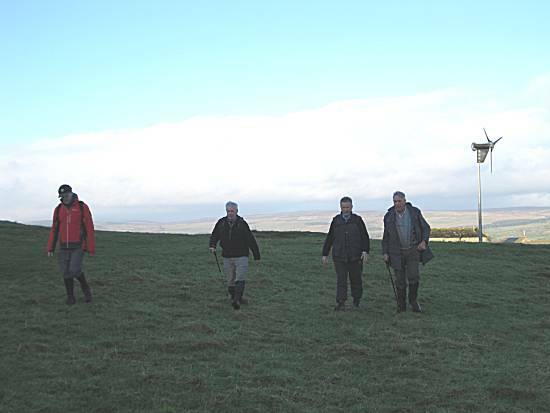 They quickly set off through the grounds of the auction mart following the road and admiring the giant Tennants auctioneers building as they left the town. 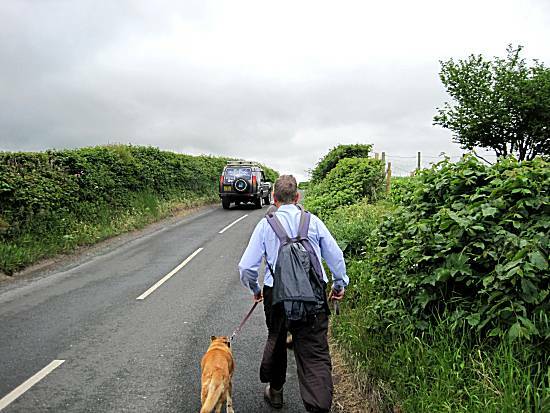 The walkers were quick to locate the infamous Harmby Quarry and where just a desolate road between two steep banks, was all that was separating it from the mobile home site. 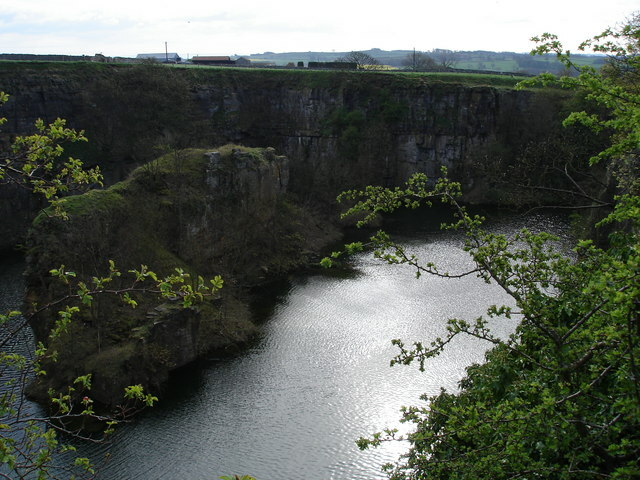 The walkers were greatly concerned that it could collapse at any time and therefore installed several tons to steel strengthen the cliffs, together with much concrete, before continuing. 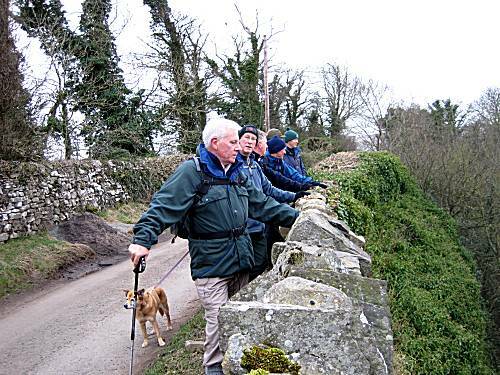 The walkers admired their work before leaving on the rest of their walk, although fear of the excessive heights can be seen to weigh heavily on Ed's mind. 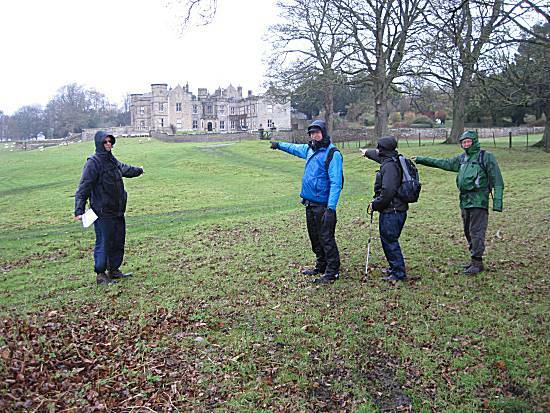 The impossible terrain soon made them stop to consult their maps, but the walkers were unable to agree the correct route, until Paul took command!! 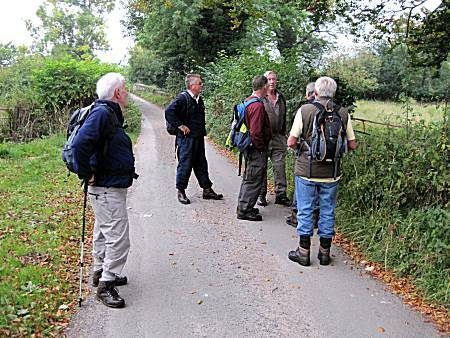 Still unsure of the route, much confusion was witnessed, with walkers heading in all directions!! 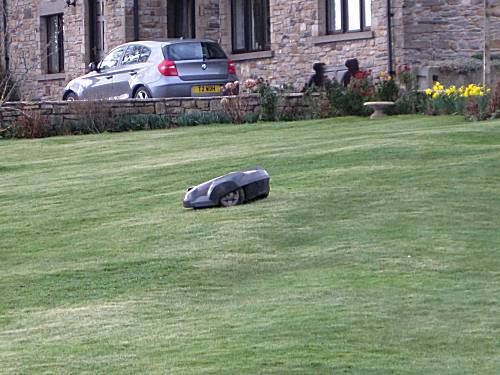 The walkers remained confused when they saw strange driverless machines mowing the lawns of the locals houses. 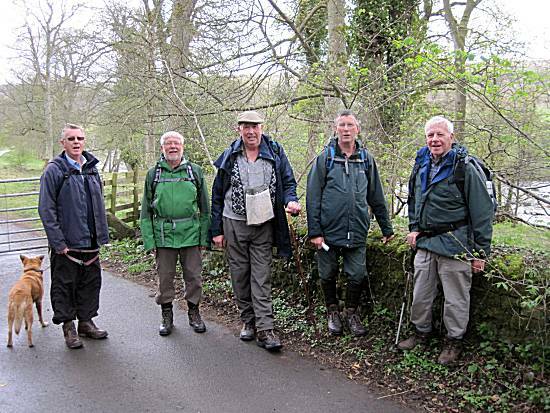 They continued in a quiet manner, hoping to find their lunchtime stop in Spennithorne. 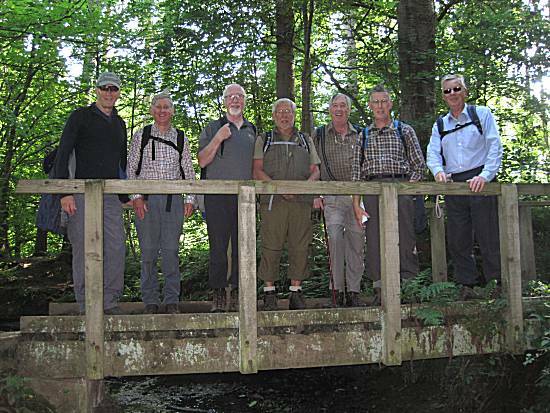 Back on track the walkers celebrated in their characteristic way by posing for a photo on a bridge . 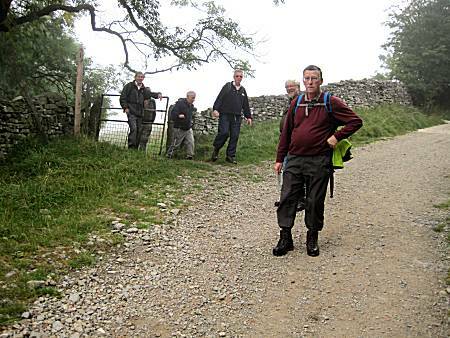 Speed picked up as Paul continued to lead the walkers towards Spennithorne. Surely nothing could go wrong now. 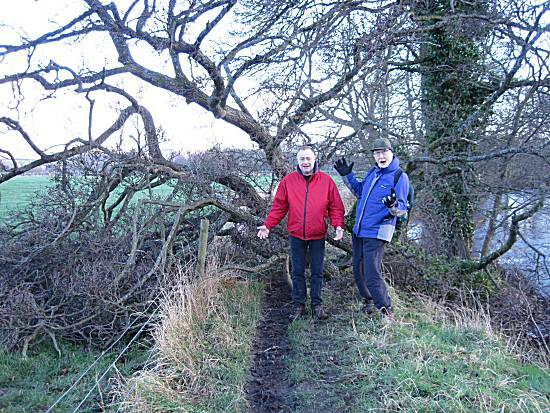 When a giant branch fell onto the walkers. 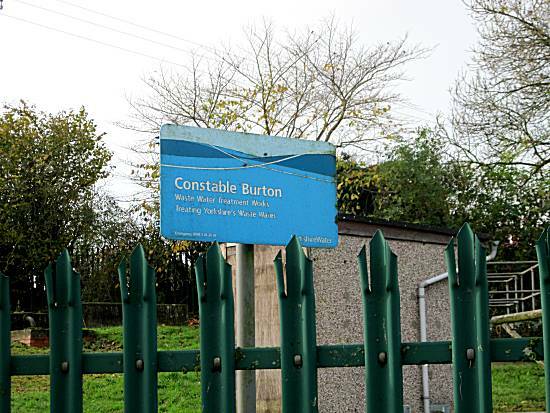 However with their incredible skills and strength, they caught the branch and carefully laid it on the ground before continuing with their mission. 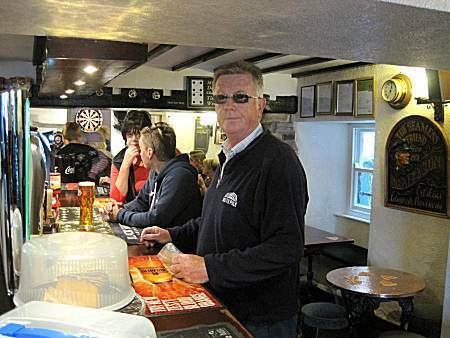 Great celebrations were seen at 'The Old Horn Inn' at Spennithorne, when Ron received a call from his daughter Lucy to advise him of the birth of his new granddaughter Lilly (5lb 12ozs) at 12-30. 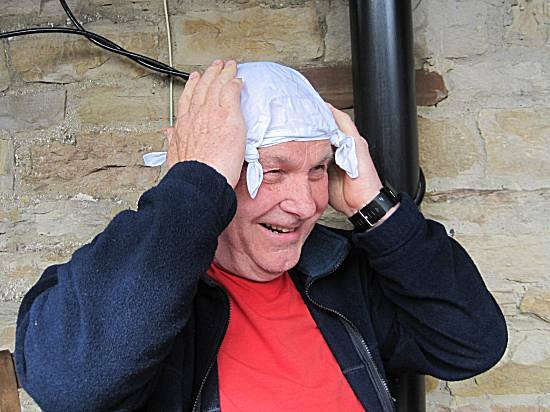 Cumberland Ale flowed freely. 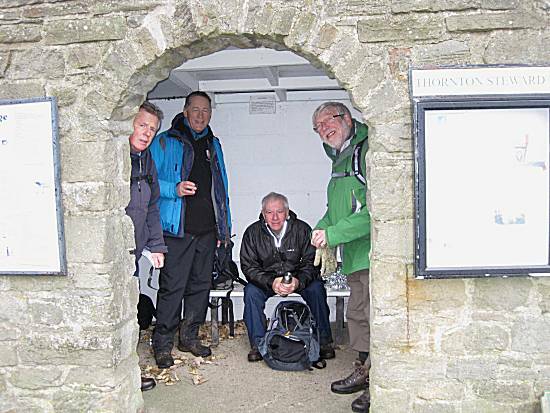 Ron eagerly awaited Tom to put on his boots, whilst the others had already left the lunchtime stop. 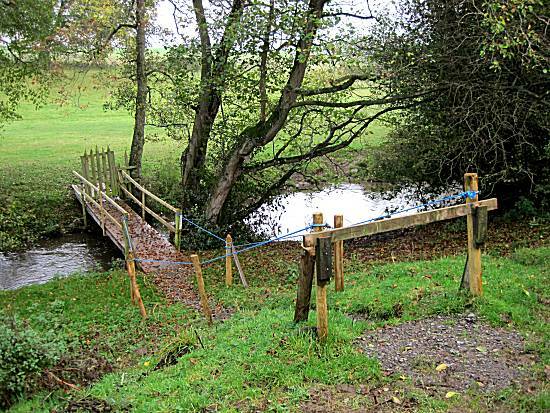 Tom felt unable to trust the bridge built by the locals and foolishly crossed the fast flowing river on foot. The others were only mildly impressed. 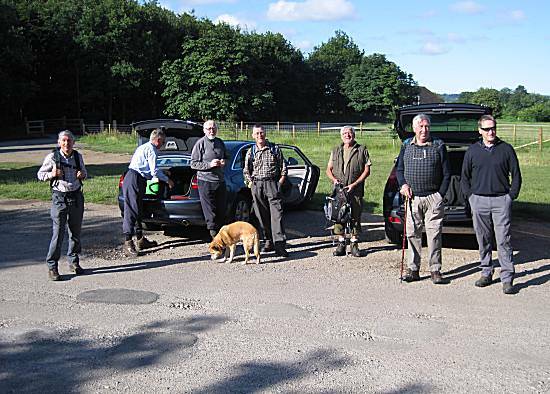 cars keen to arrange the next walk on the 25th April. Chip Score: 8 generous bowls of good quality chips. 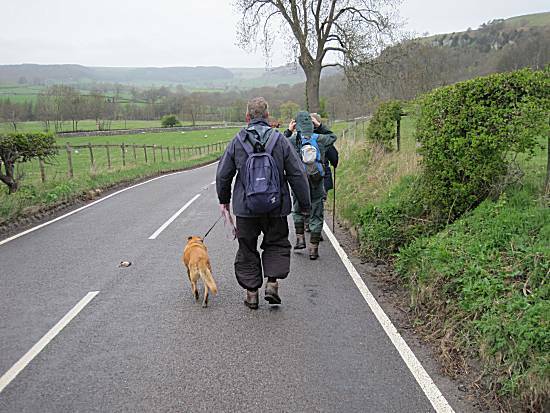 Weather: A pleasant walking day for the first day of spring, but still a little cold. 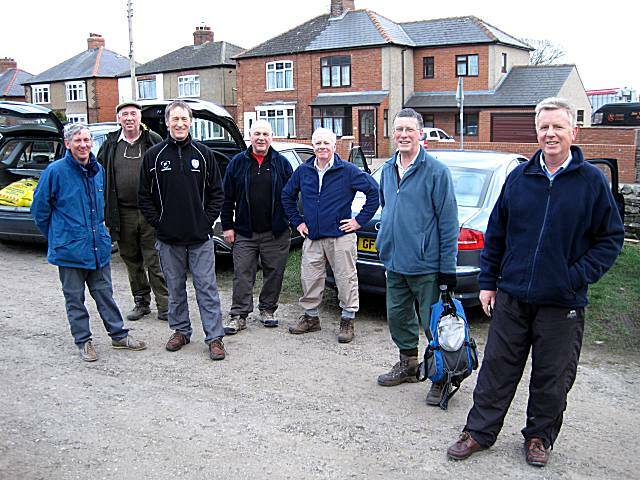 The eager walkers arrived at the especially reserved car park places in Marske, where they all welcomed Cliff back to full walks and celebrated with splendid sausage, bacon & egg butties, courtesy of Ron. 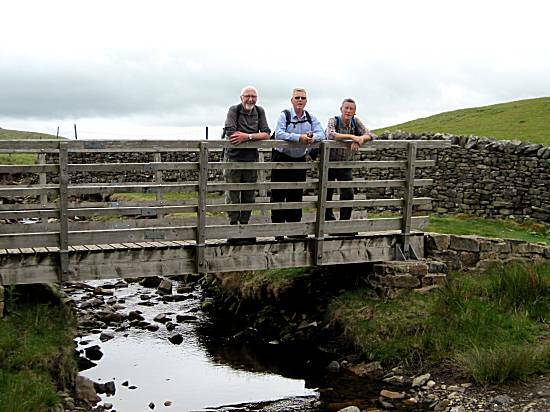 Although setting off on the usual route, they soon deviated onto new ground, in search of new bridges. 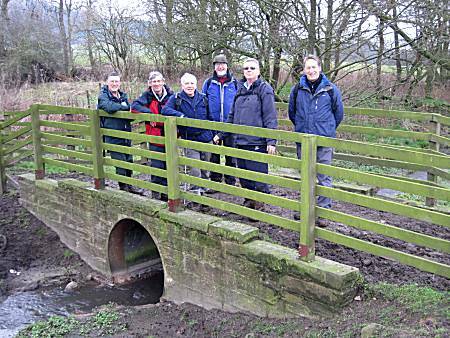 They quickly found a bridge that had been cunningly disguised by the locals and characteristically gathered for a group photo. 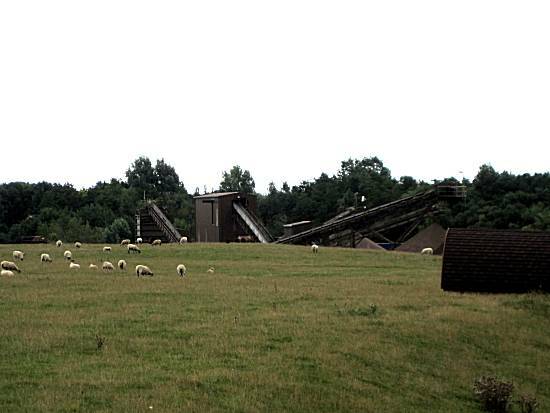 When they noticed that the giant waterwheel feeding energy and water to the locals remained stationery and dry. 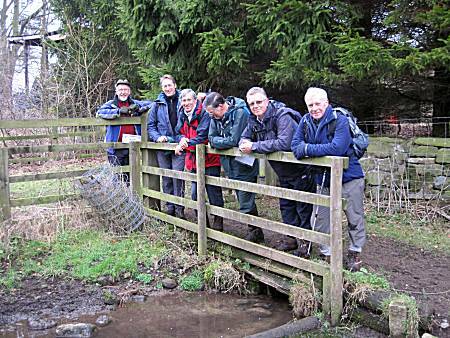 Quickly the intrepid walkers carried out in-depth investigations. 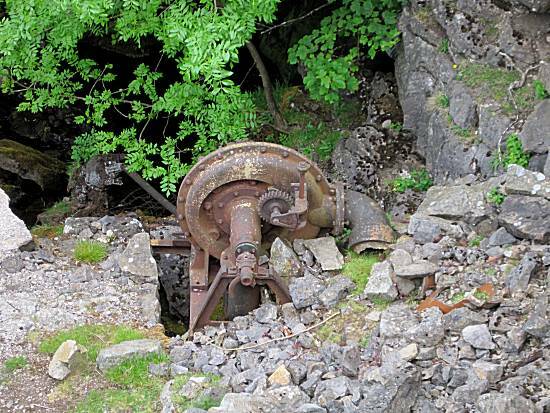 Even after minor repairs were completed on the wheel, it was clear that the water supply had failed!!!!! 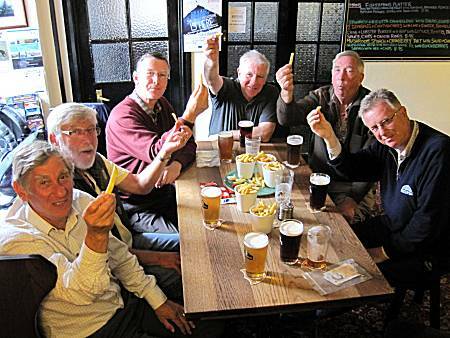 They felt an obligation to find a solution to the local's dilemma. 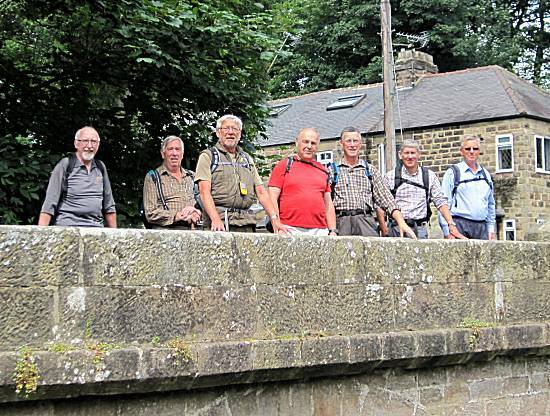 Instinctively, the walkers knew that studying all the local waterways by locating bridges would give them a clue as to why no water was reaching the waterwheel. 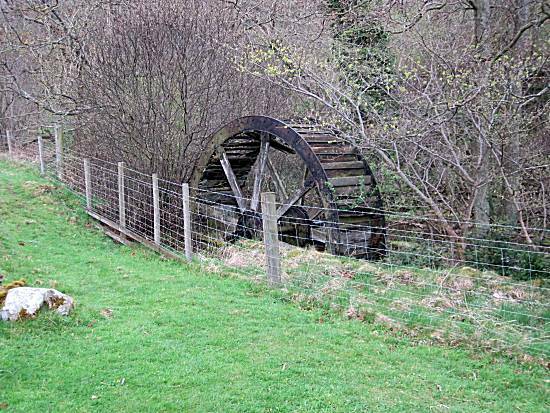 Using their impressive analytical skills they knew that the water to the waterwheel must have been switched off and set off in search of the tap, stopping only briefly to consume their Pork Pie rations. 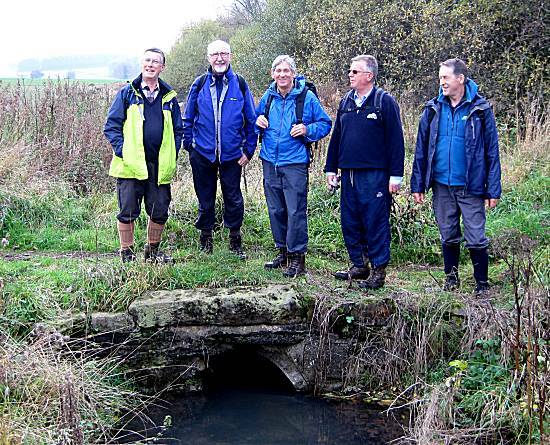 The cunning walkers consulting with some of the knowledgeable locals, who suggested that the tap may be located at long disused and lost lead smelting works. 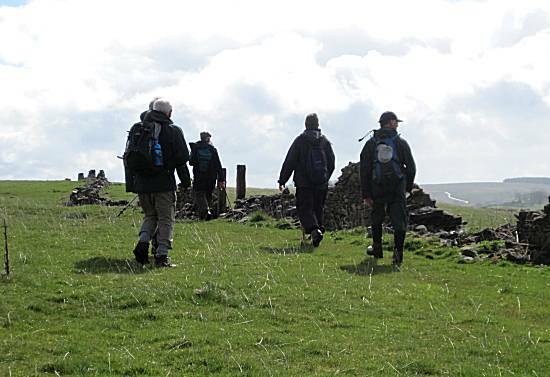 The walkers set off at great speed and in great anticipation. 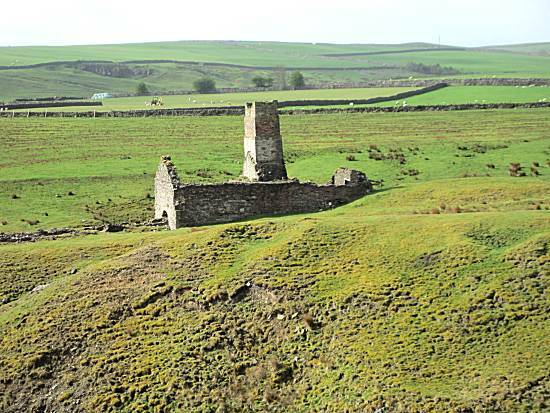 In the distance, a vision of the long lost and disused smelting works came into view. Could this be the where the missing tap is located? 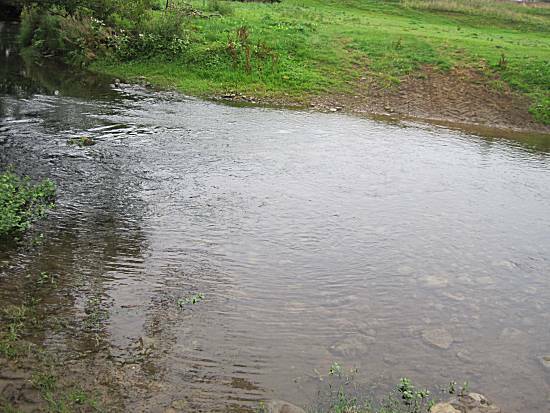 Ed's determination paid off, when under a large stone, he found the tap controlling the water to the waterwheel. 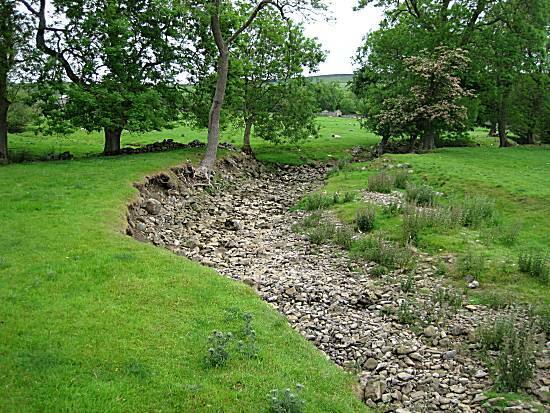 With great difficultly he can be seen turning the tap back on and restoring the water and livelihood to the locals. 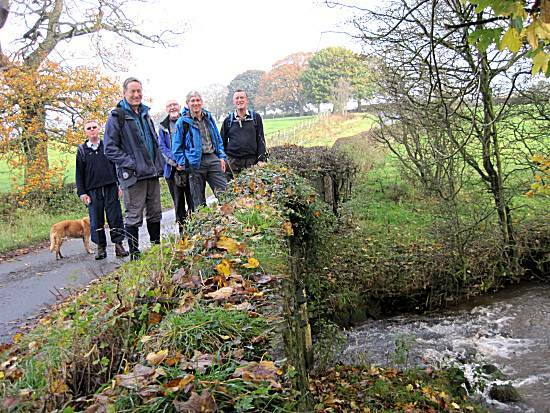 Within seconds the water started flowing and the walkers were pleased to know that they had again saved the lives of the locals. 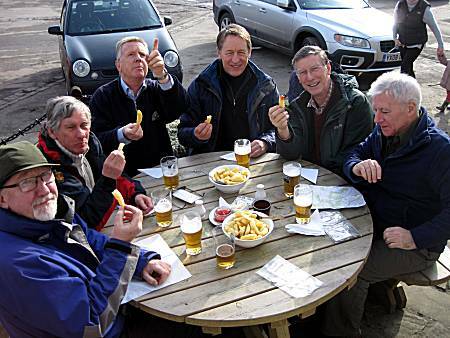 Chip Score: 6 generous bowls of home made chips. 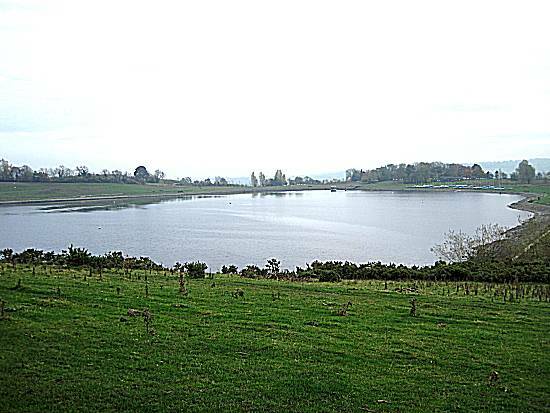 Weather: A damp, but pleasant walking day, with light rain setting in towards the end. 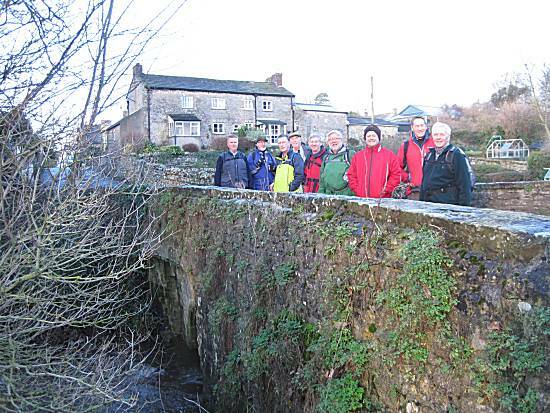 An exceptional turnout of 8 walkers met at Ronnie's farm (brother of Cliff) in Reeth, where special car parking spaces had been reserved, in return for one of Cliff's egg, home made sausage and bacon butties. 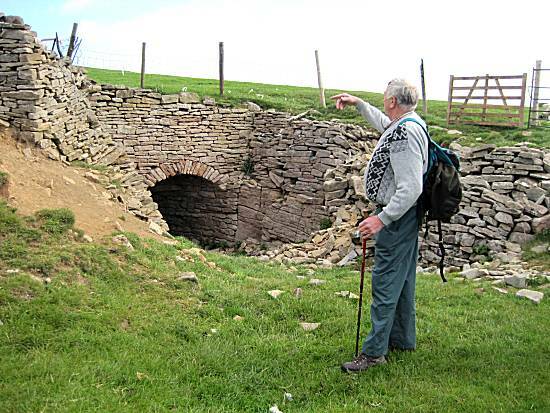 The walkers listened intently to stories of a giant hidden tunnel in the feared Fremington Edge area. 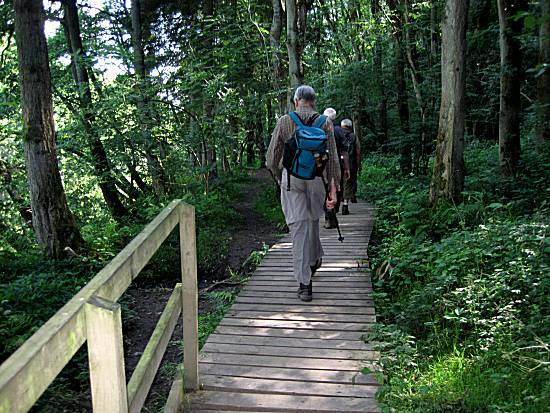 The locals were to frightened to go into the area, but the brave walkers instinctively felt a need to investigate. 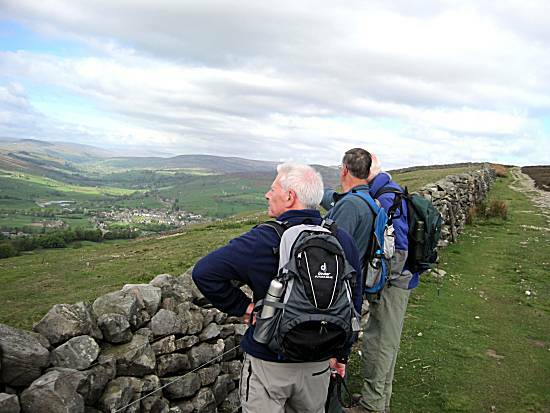 They quickly set off reaching unbelievable speeds on the GPS, climbing to the very top of Fremington Edge in record time. 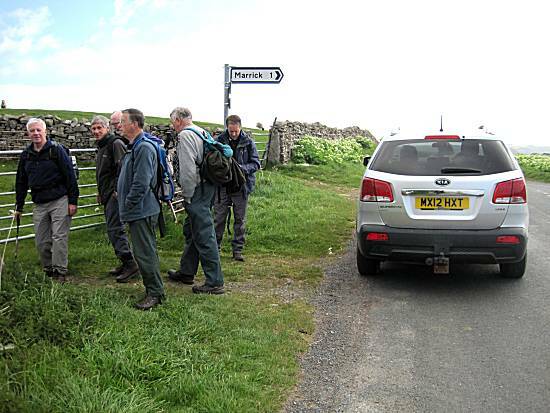 Ronnie, in his Kia, can be seen desperately trying to persuade the walkers to turn back, but of course, they waved him away. 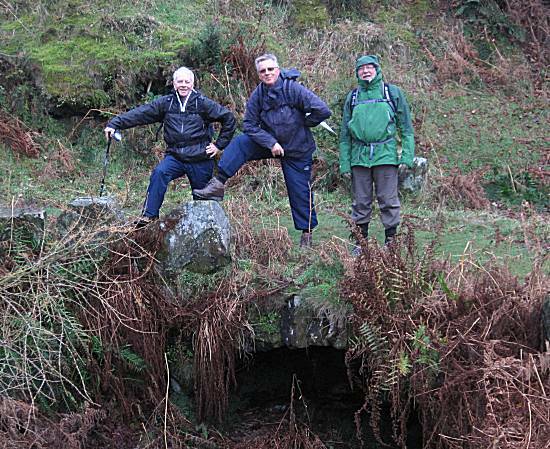 The walkers set off in an attempt to find evidence of the giant hidden tunnel, but realised that they would need to gather extra strength, by assembling on the nearest bridge. 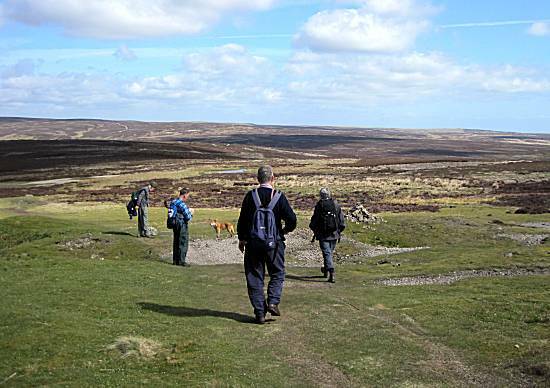 The walkers were seen trying to find evidence of the tunnel, but were distracted by the incredible views from the great height of Fremington Edge. 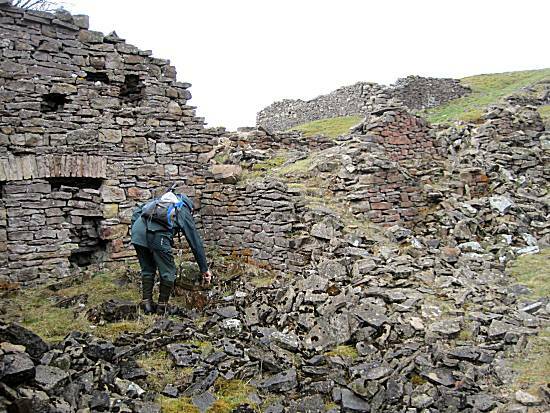 Cliff was first to find the cunningly hidden entrance to the tunnel and quickly estimated the likely trajectory and with his tremendous knowledge of the terrain, mentally calculated the precise location of the tunnel end. 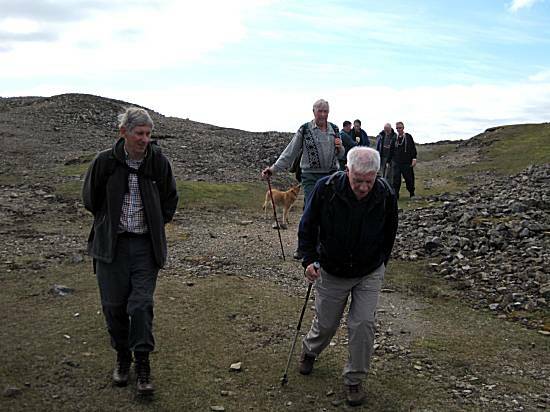 The other walkers stood back in admiration!! 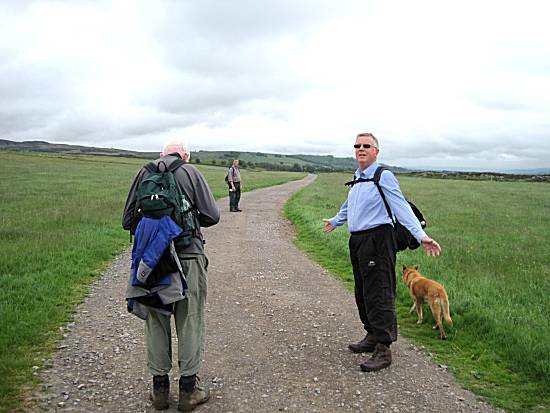 Vast distances were travelled in the difficult conditions, but Cliff knew they were travelling in the right direction. 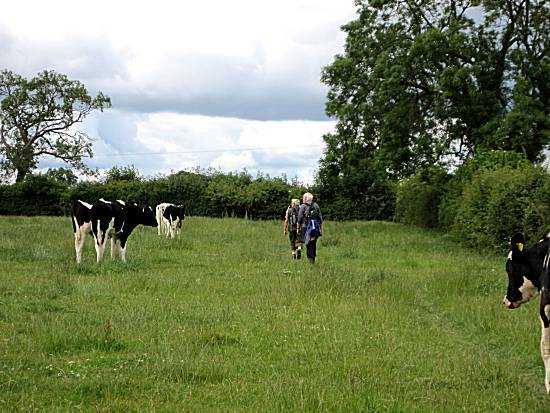 The walkers dismissed strange objects in the fields, knowing that this was in fact attempts by the locals to put the walkers off their track. 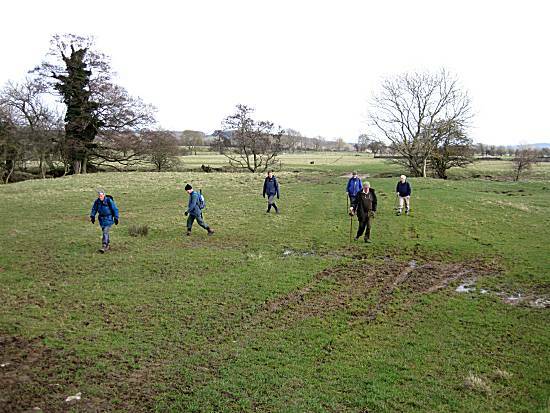 The walkers knew they were getting close when they saw evidence of vast earthworks, but realised that the exit would be cunningly hidden. Ed felt he could detect the tunnel close to the surface by stamping on the ground. The others tried to ignore him. Despite the creditable attempts of the walkers to locate the hidden exit to the tunnel, it was Ella that located the tunnel exit, discreetly hidden beneath a pile of stone. 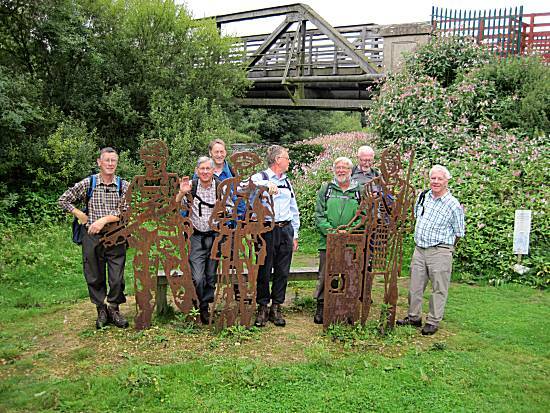 Immediately the walkers celebrated their success, by locating the nearest bridge and posing for a group photo. 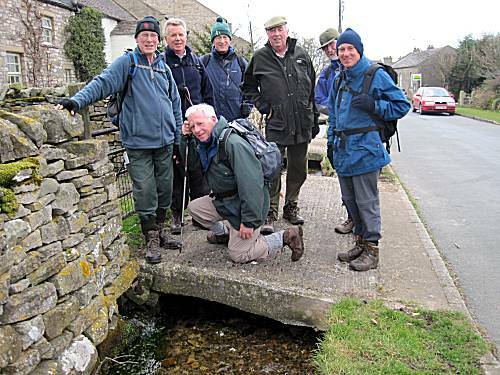 When after crossing the river and walking many miles, they realised that the river lay between them and their intended lunchtime stop at Grinton. 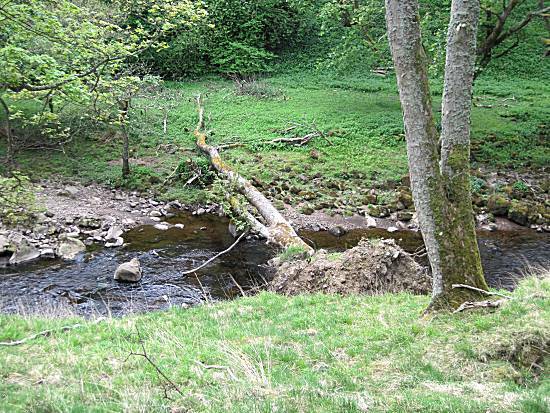 With super human strength, they uprooted a tree and lay it across the river to form a makeshift bridge, so that access was possible to their lunchtime pub stop. They knew that the locals would be eternally grateful. 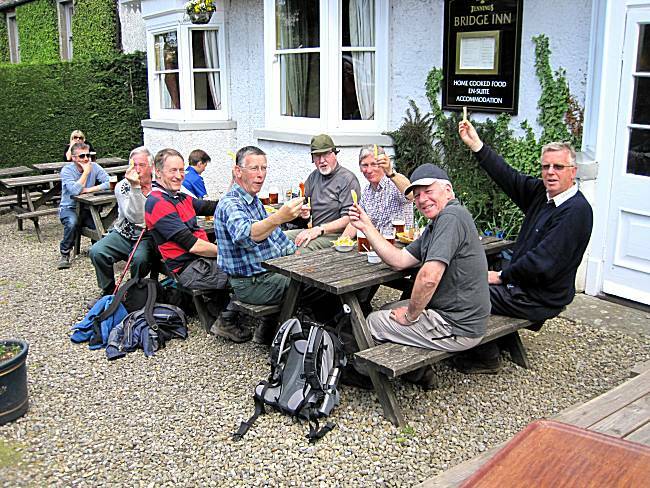 The walkers gathered outside the pub which had been renamed "The Bridge Inn" in recognition of the newly created bridge constructed for the locals by the walkers. 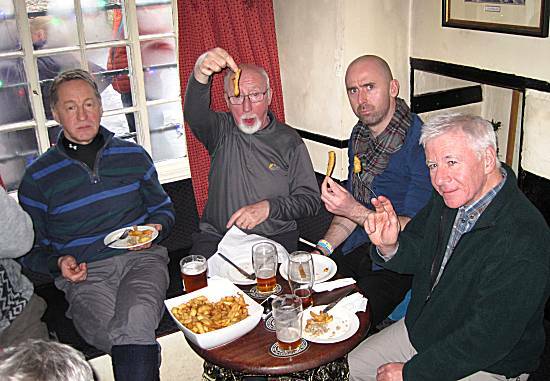 The walkers celebrated their successes with Jennings Cumberland Ale and nourishing chips. 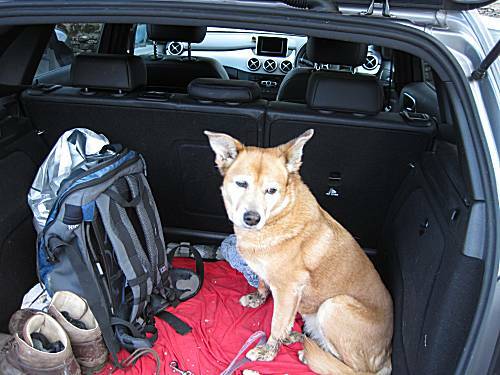 Ella was exhausted after her extreme efforts throughout the difficult day. 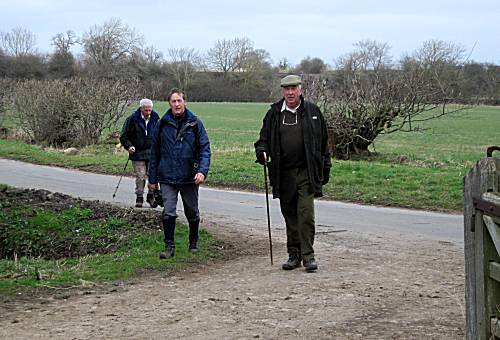 The walkers paused briefly with some grateful locals as they made their way back their cars. 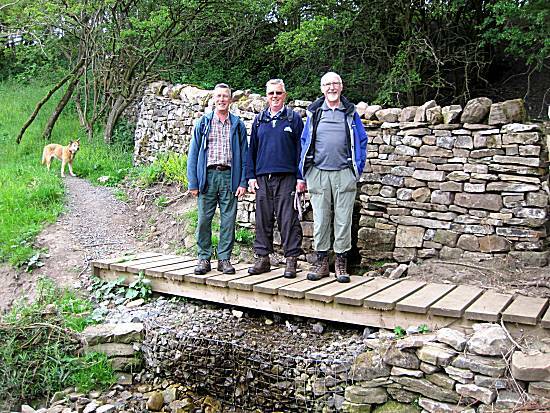 Just one more dangerous bridge had to be crossed before the walkers reached the safely of their cars. 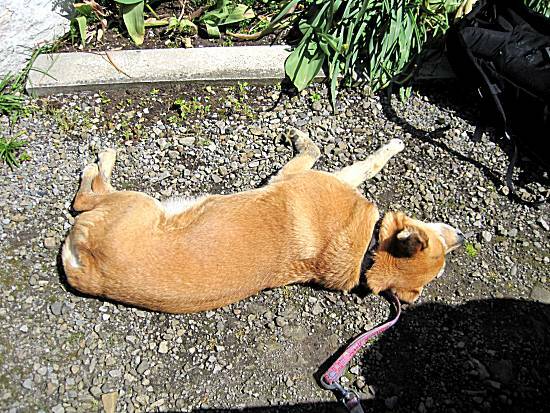 Weather: A hot and sunny walking day. 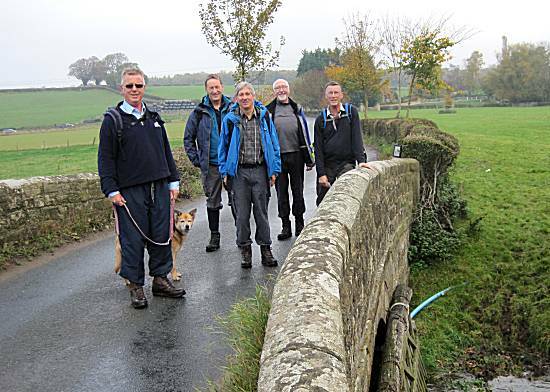 Just four intrepid walkers and Ella the dog arrived at the layby just past Aysgarth at the appointed hour, quickly devouring Ron's delicious sausage, egg and bacon butties. 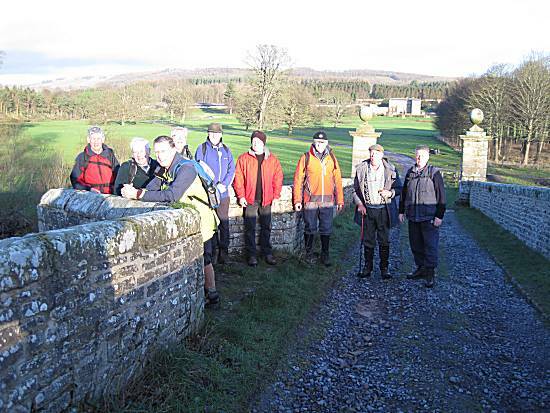 They set off on their "straightforward" walk to Bolton Castle along the infamous high route and then back to Aysgarth following much of the route of the river. 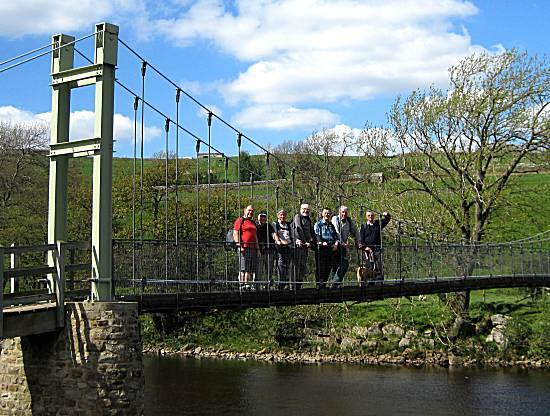 However, as they crossed the first bridge, they had a strange feeling that something was wrong!!! 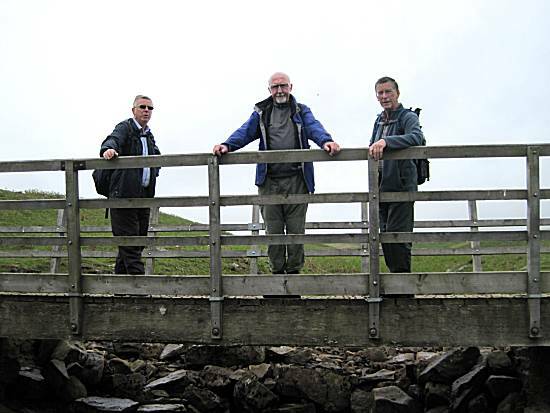 Crossing the second bridge they became greatly concerned that the waterway appeared to have been deliberately blocked with stones and only a small amount of water could get though. 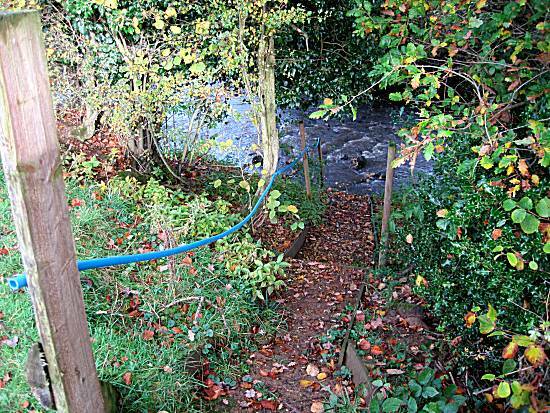 Their suspicions were confirmed as they passed empty river, after empty river. 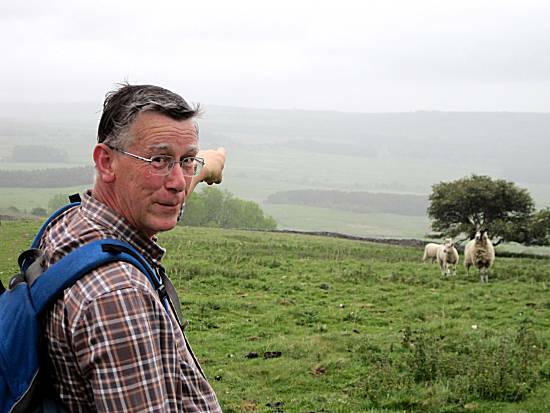 Paul became gravely concerned, as in the swirling mist, he was unable to see Bolton Castle in it's usual position!!! 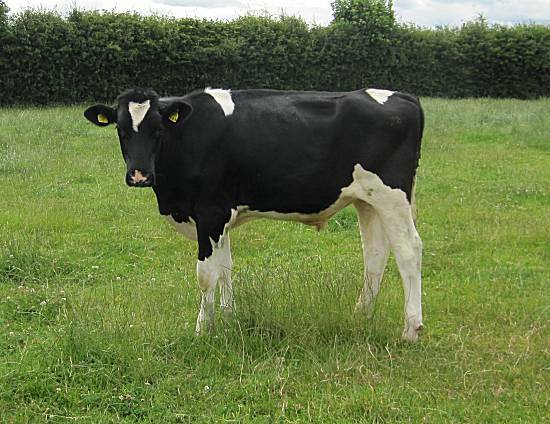 Had it been stolen they thought!! 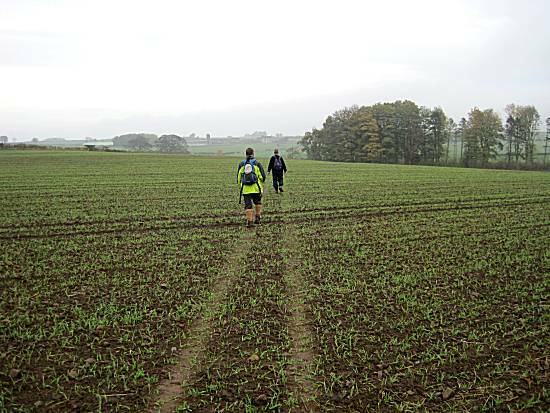 The walkers set off at high speed, but remained mystified by the strange occurrences. 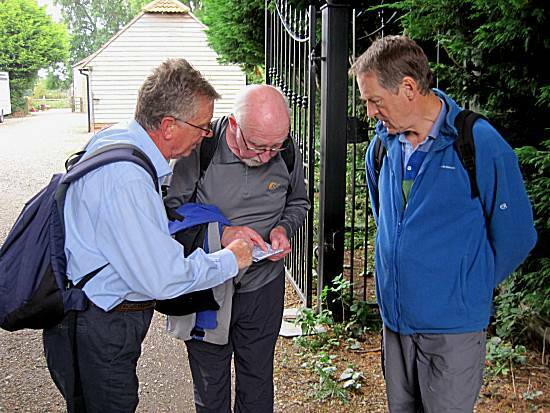 As Tom studied the maps, Ron remained exasperated!! The plot thickened as fierce creatures were seen in the undergrowth, devouring the locals, but the walkers were not frightened. Paul then made an incredible discovery!! 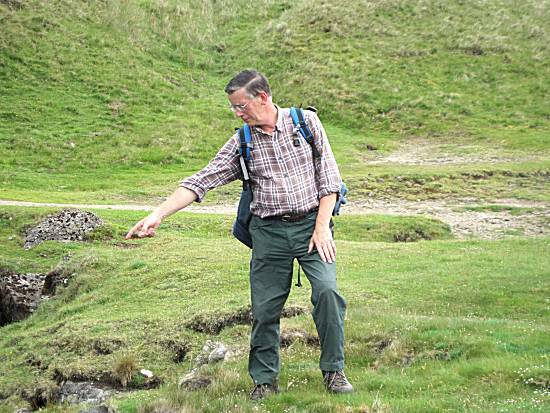 He spotted a discarded pump by a cliff. 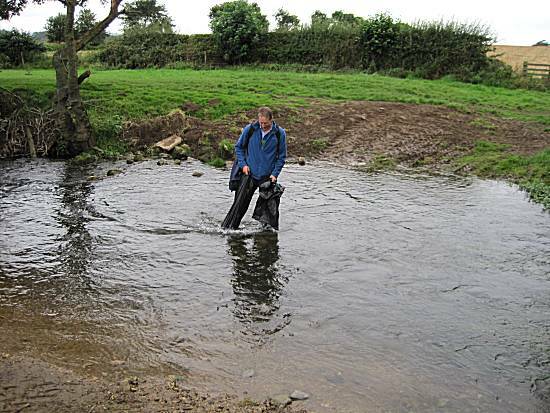 Could this be the answer to the lack of water in the rivers? 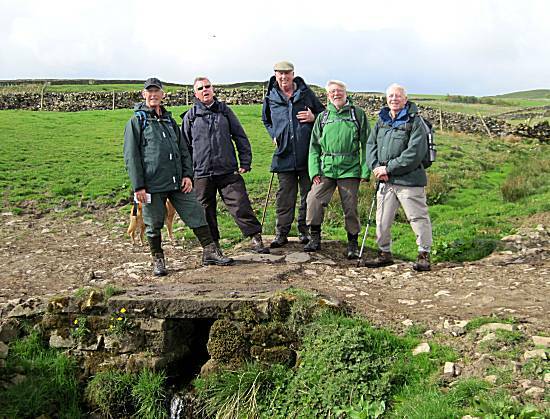 On crossing yet another 'dry' bridge the walkers concern grew and they realised that they must take immediate action to 'Save the Dales'. 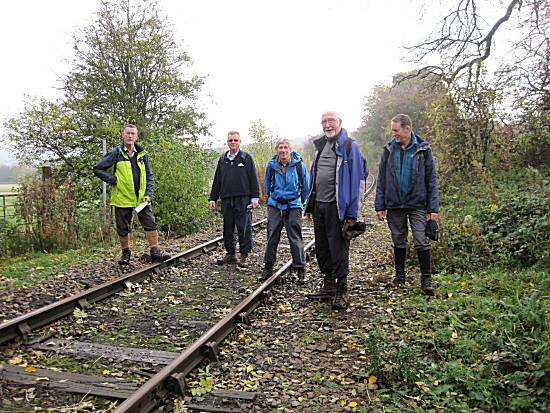 The walkers could not believe their eyes when that found that the railway had also been stolen!!! 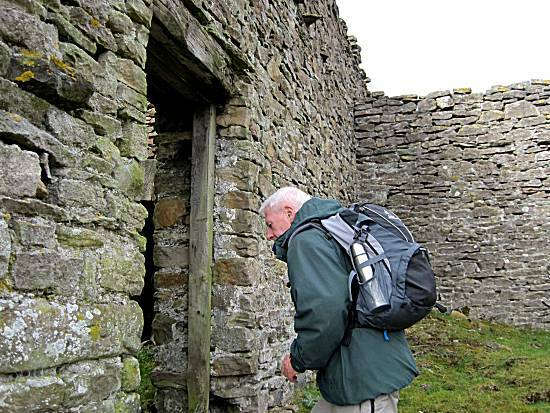 They realised that finding Bolton Castle was the only answer, but where had it been hidden? Quickly they made their way to a bridge where they concentrated their combined energies and could be seen contemplating for some time. 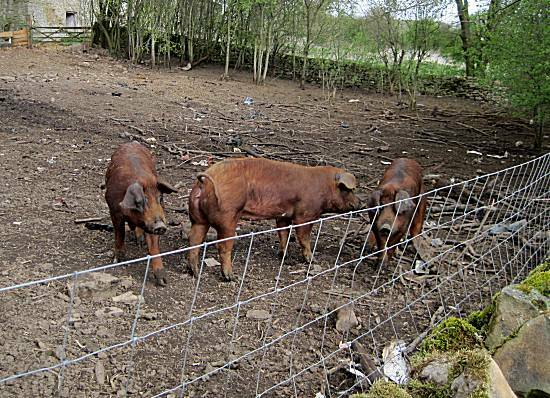 They soon came up with a cunning plan!! Fuelled by their combined strengths they quick made their way to a forest, where Ella spotted what she thought was a castle cunningly hidden !!! 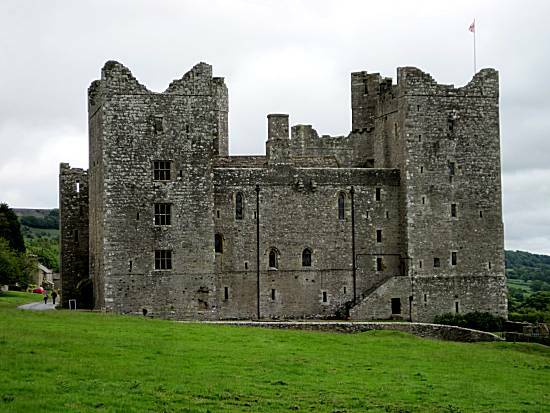 Hidden behind the trees there was indeed Bolton Castle!!! 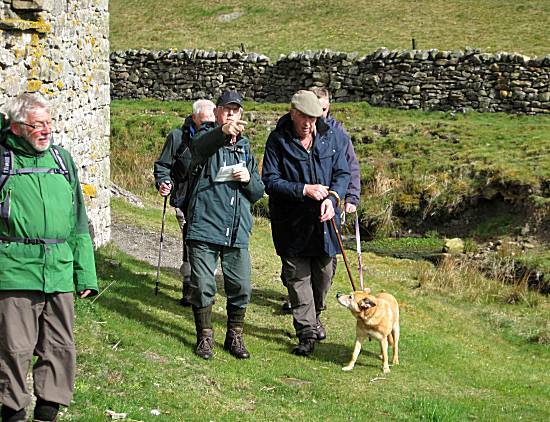 The walkers instinctively knew that the plot to destroy the Dales had been foiled and they quickly set about moving the castle back to it's proper position. The locals were eternally grateful. 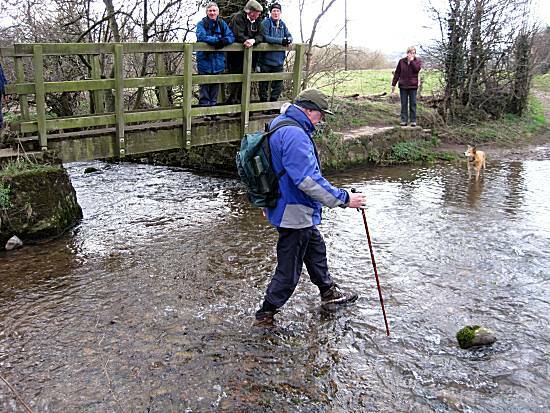 The walkers were relieved to find that water was again flowing in the rivers. 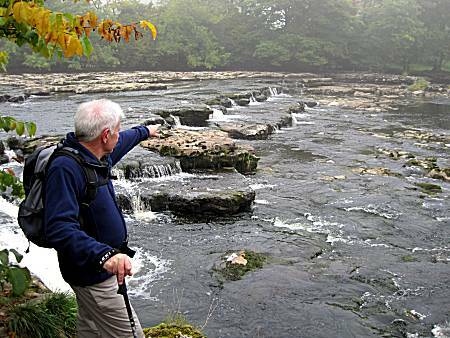 The walkers quickly made their way to the Aysgarth Falls Hotel, where they feasted upon nourishing chips with Black Sheep Ale. 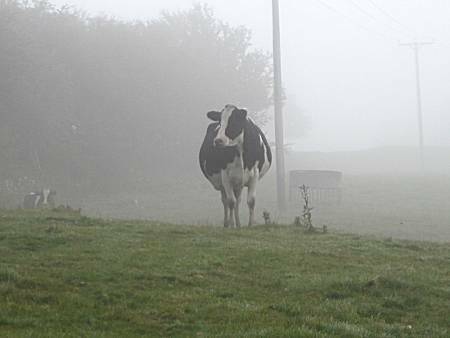 Weather: Damp and misty in the morning, but after their successes, turned into a sunny and warn afternoon. 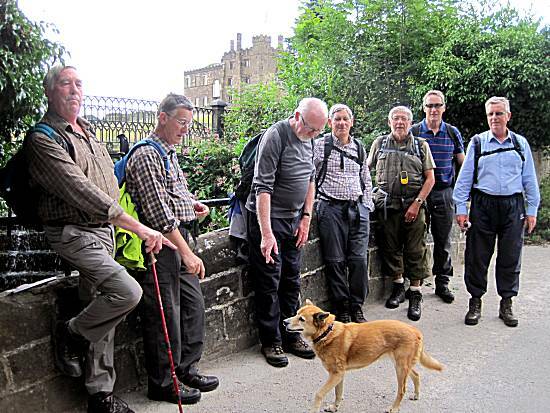 An excellent turnout of 8 walkers arrived at the free car park in Ripley, ready for another testing walk. 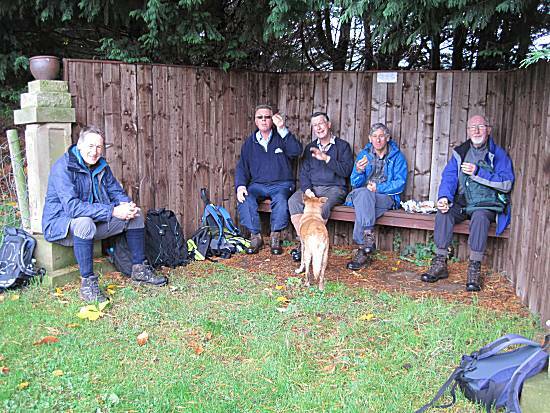 Ron's sausage, bacon and egg butties were greatly appreciated before the walkers set off in the Harrogate direction!! 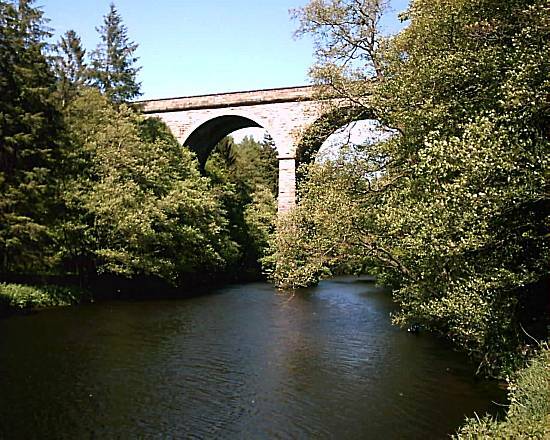 Indeed they soon found the viaduct and marvelled at it's construction, having 3 arches. 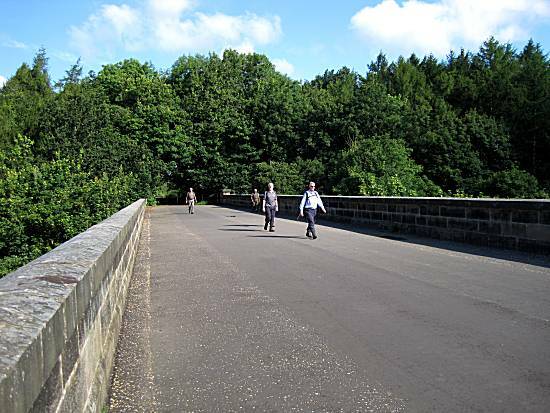 The walkers knew that the Nidd viaduct at Bilton stands 104 feet above the river and was built in 1848. 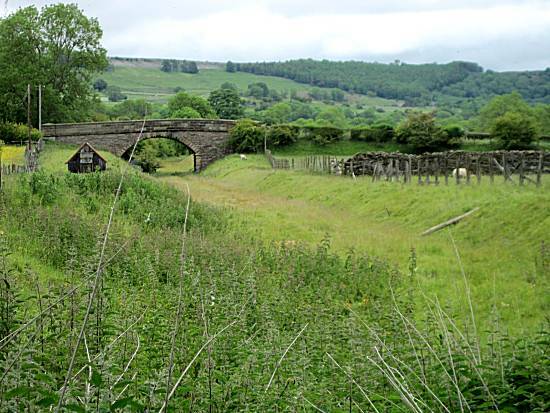 They further knew that it was part of the now defunct railway line which used to run to Ripley, Ripon and Thirsk, carrying freight (mainly coal and later gas) and passengers until it closed completely in 1967. 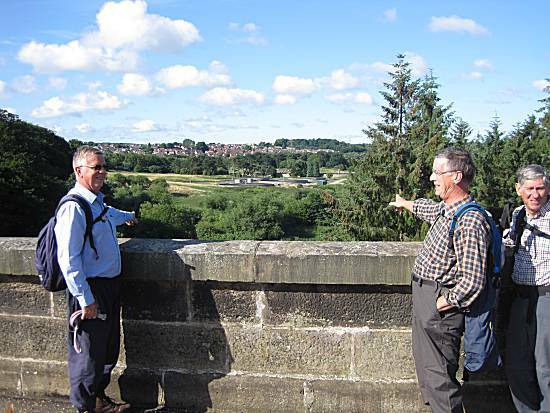 After crossing the viaduct, Paul directed them to follow the River Nidd through picturesque countryside. 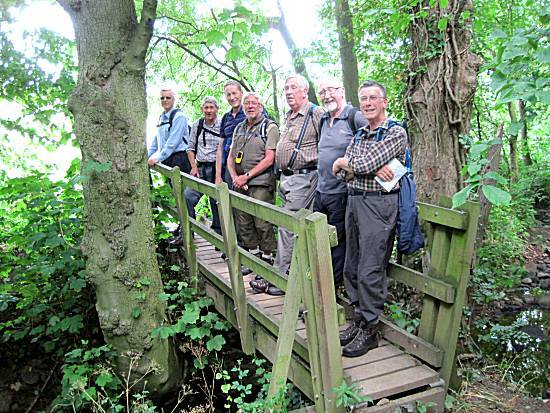 The walkers were grateful that the locals had constructed timber walkways to assist their passage. 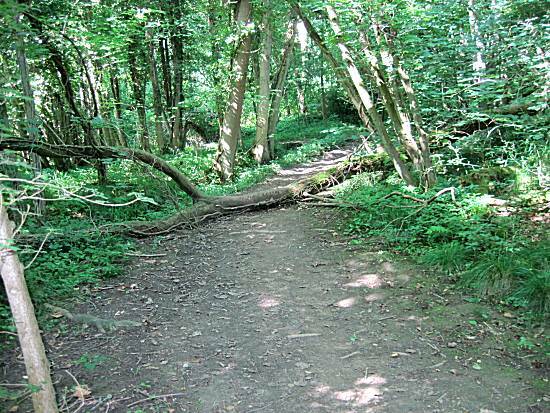 When it was found that their passage was blocked by a fallen tree. Could this be the end of their adventure? 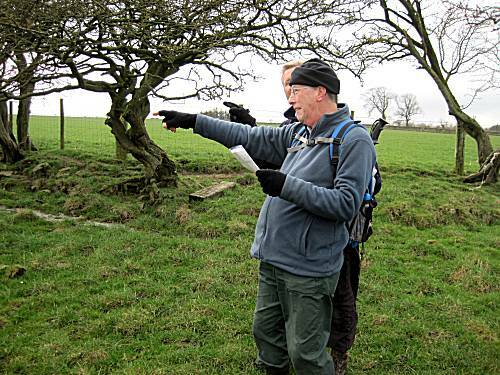 Alan quickly formulated a plan and instructed the other walkers to step over the tree. The plan was successful. 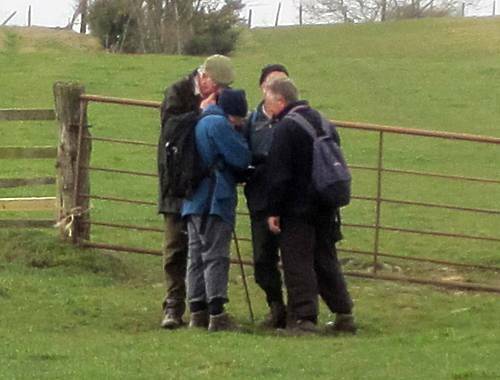 Considerable discussions were witnessed as the walkers argued about the best route. 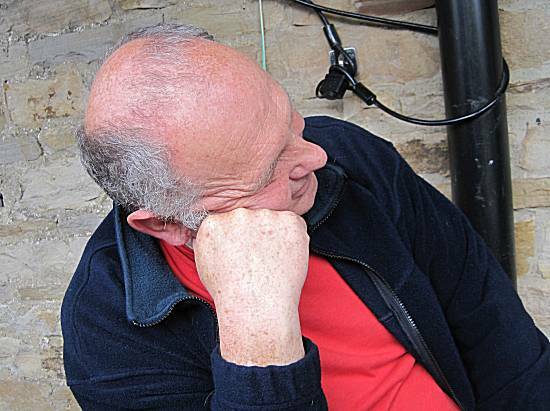 However, it was obvious that Cliff would take no part in these discussions as his knowledge of the area was extensive. 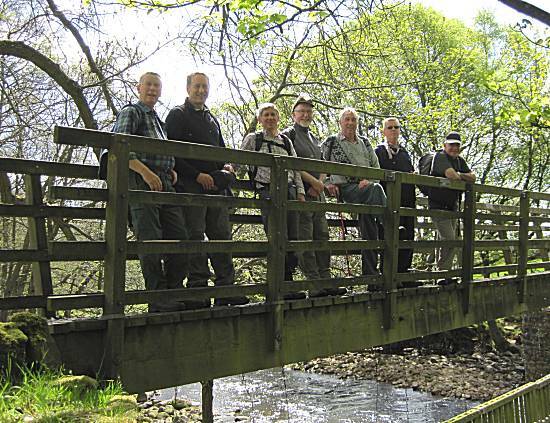 The walkers soon navigated round the more dangerous areas of Bilton and successfully located the bridge over Oak Beck. 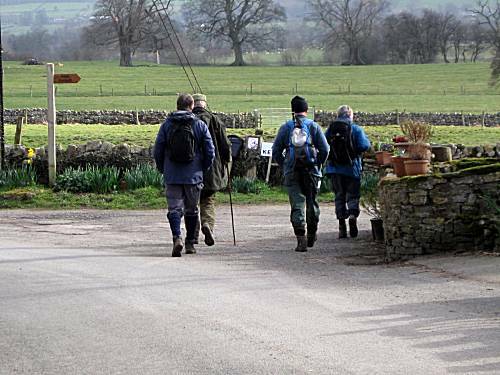 The locals were amazed at the progress of the walkers as they left Killinghall and notified the residents of Hampsthwaite of their imminent arrival. 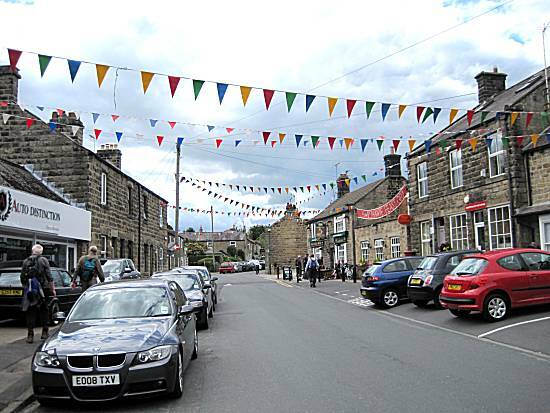 The walkers were humbled to see the way that Hampsthwaite had prepared to welcome their historic arrival!! 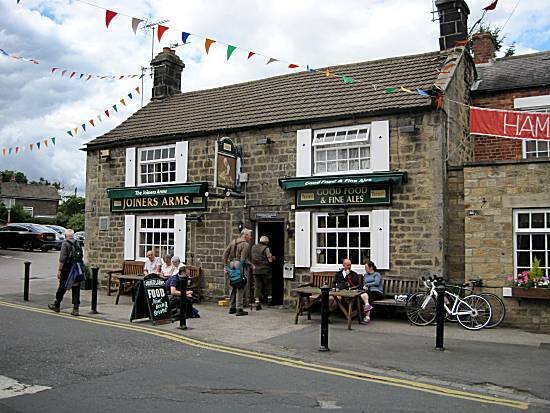 They quickly made their way to the Joiners Arms? 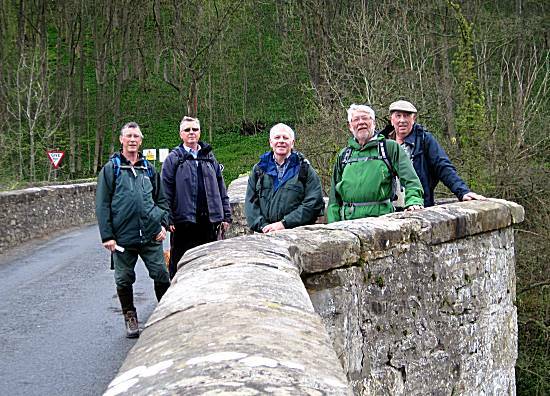 Leaving Hampstwaite the walkers again crossed the River Nidd before heading into the grounds of Ripley Castle. 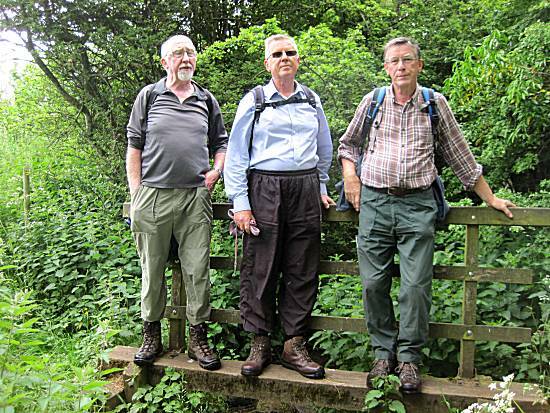 They knew that a successful completion of the walk was within their grasp. 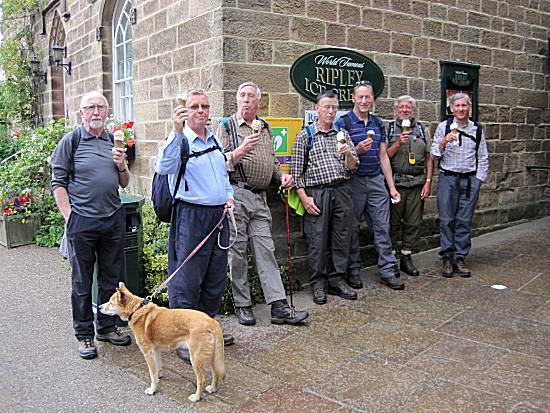 The walkers were seen enjoying well earned World Famous Ripley Ice Creams after completion of yet another groundbreaking walk. Chip Score: Two giant portions of chips. Weather: A warm and sunny days, turning a little cloudy in the afternoon. Just started to rain as they completed the walk. 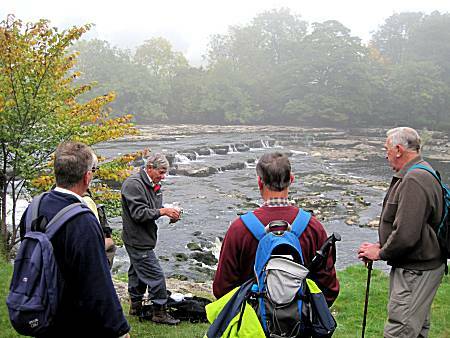 The walkers were swiftly transported to the official start point at the old Station in Richmond, where Ron's Bacon, Sausage and Egg butties were enjoyed, before they set off following the river at 9:15. 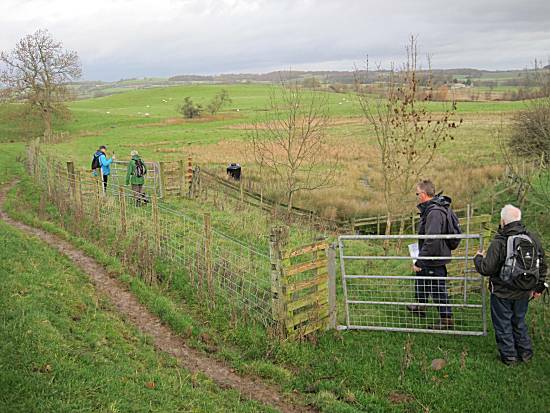 It was not long before the walk was in trouble, as Tom struggled with the map, desperate to locate the correct route amongst the confusing network of paths. 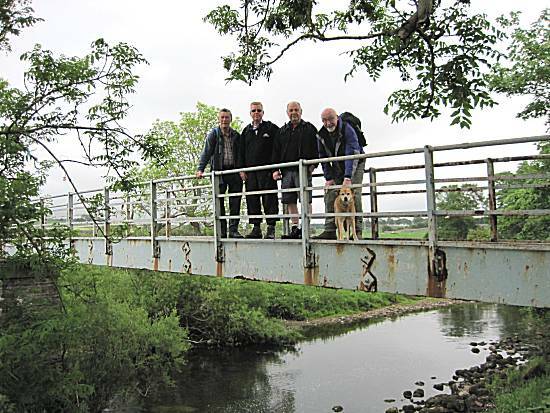 The walkers discounted certain bridges as not being up to their normal standard !! 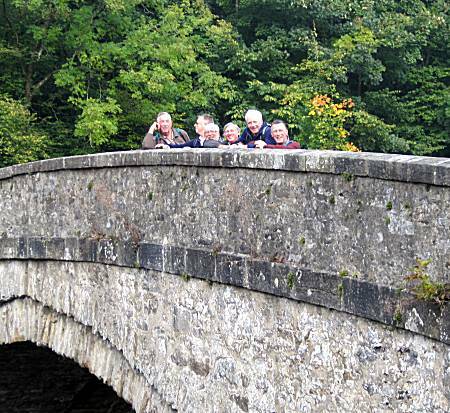 The locals remained very quiet in their menacing outfits, but valuably assisted them by alerting them to a bridge, behind them!! 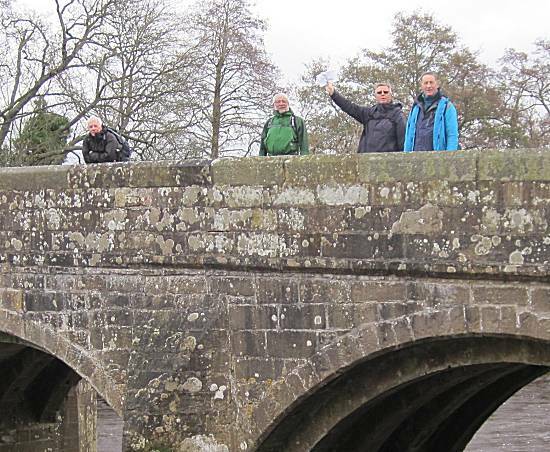 The walkers were jubilant at finding the disused railway bridge that once carried trains from Richmond to Darlington, until closed to passengers on the 3rd March 1969. 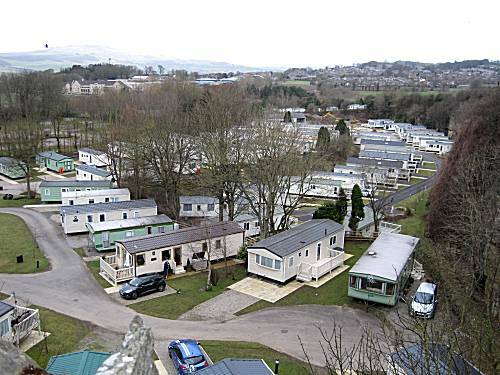 The walkers failed to get excited even when they spotted, what they were convinced was fun-fair built by the locals for their pleasure. They remained suspicious of the long slides and passed without stopping. 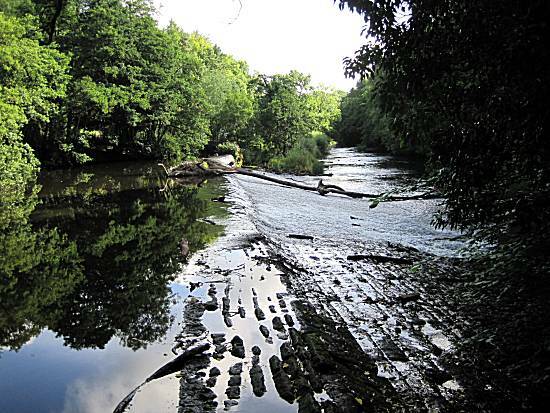 When they found their passage blocked by a deep and fast flowing river. 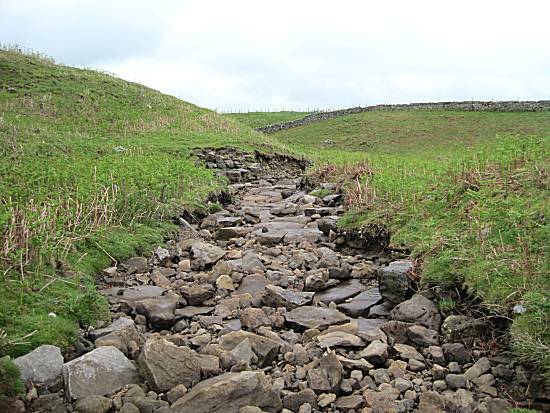 Surely this would be totally impassable and bring the adventure to a premature end!!!!! 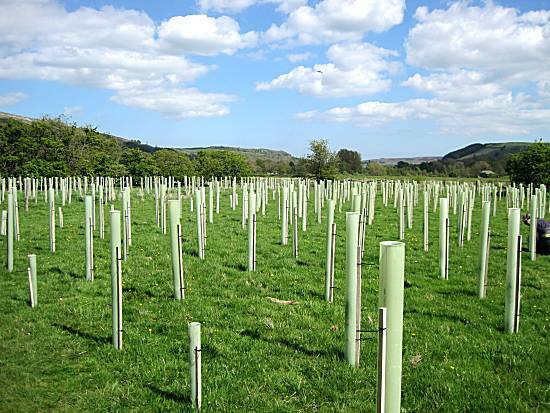 Tom pondered and pondered and the others instinctive knew that he was planning a cunning solution!! 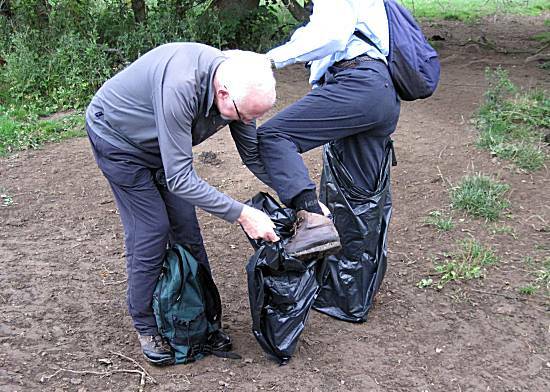 Tom took from his rucksack rolls of specially prepared bin liners and helped Ron add special waterproof floatation collars to his feet. 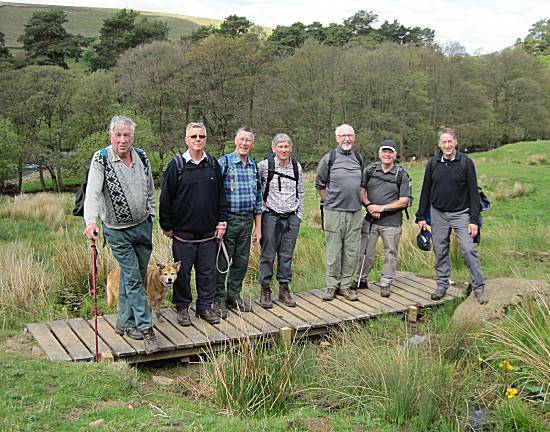 Although his solution proved successful, only 4 of the walkers were brave enough to attempt the crossing and the others set off to find an alternative crossing!!!! 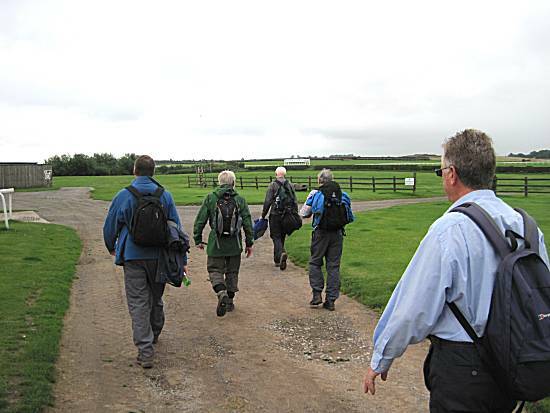 The walkers eventually met up again and decided that the only route open them was to cross the wilds of Catterick Racecourse. 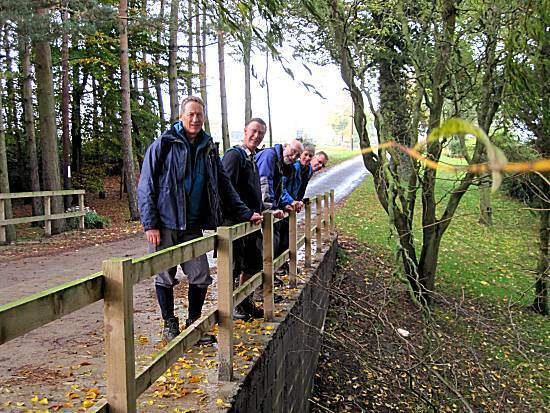 This route exhausted the walkers who knew that a successful completion of the walk could only be achieved with outside help!! 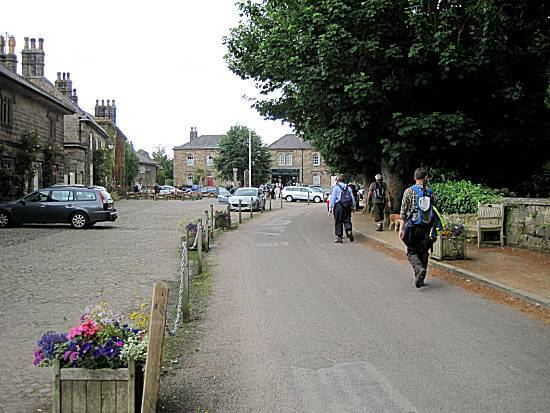 As the walkers passed through the village of Low Green, they realised that the locals had arranged for a taxi to collect them and rapidly transport them to Tom's house, thus saving the mission and the walkers from an untimely end. 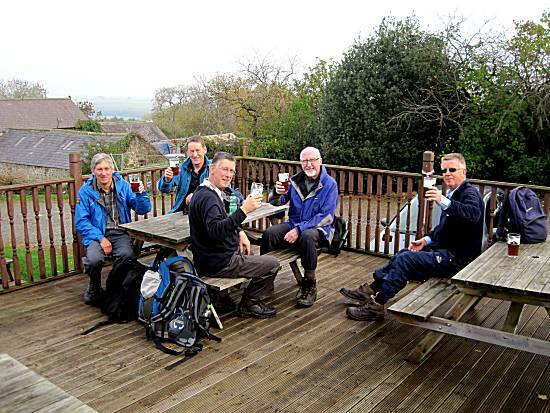 Knowing that they were at last safe, the walkers made inroads into a specially procured barrel of Black Sheep ale, whilst Tom and Ed prepared a wonderful BBQ for the hungry and grateful walkers. BBQ Score: Wonderful BBQ with splendid Black Sheep Ale. 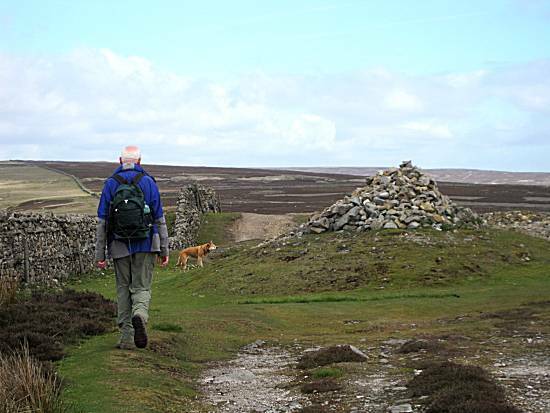 Weather: A warm overcast day at first, turning into a sunny afternoon, before heavy rain and thunderstorms arrived after completion of the walking. 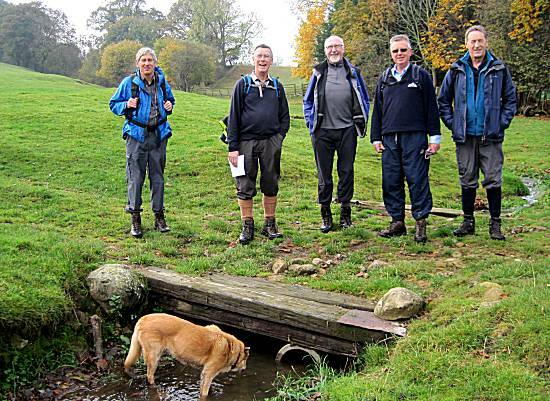 The walkers arrived at the residence of Lord Bailey of Thoralby at 8:30, where they were welcomed with high quality bacon, egg and sausage butties. 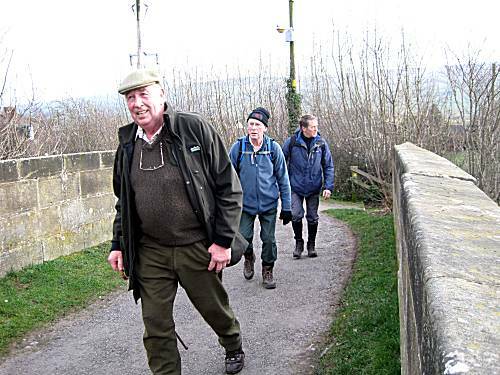 Although Jon attended and partook with a butty, he announced to the dismay of the other walkers, that he would not be walking and preferred to chisel floor tiles instead. 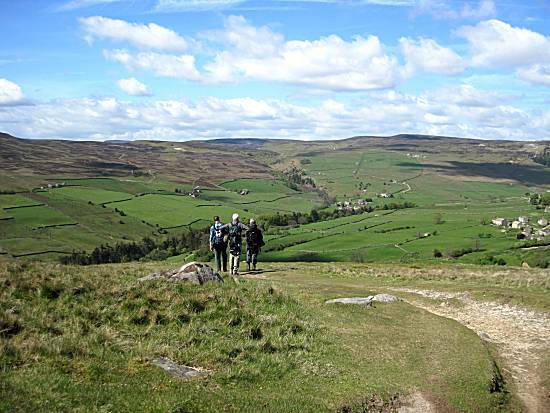 Therefore just 7 walkers departed at 8:45, turning to ascend the steep track towards Thoralby Haw. 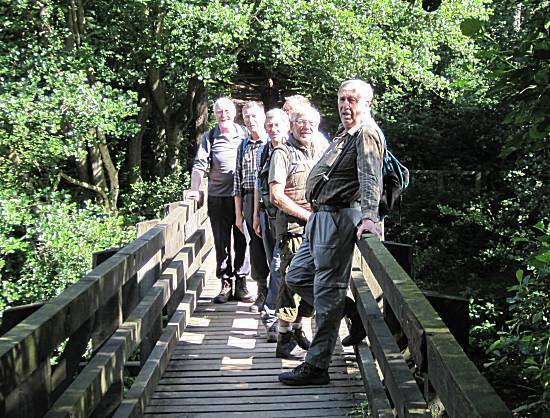 In the bright conditions the walkers were overjoyed to locate a bridge where they quickly gathered strength. 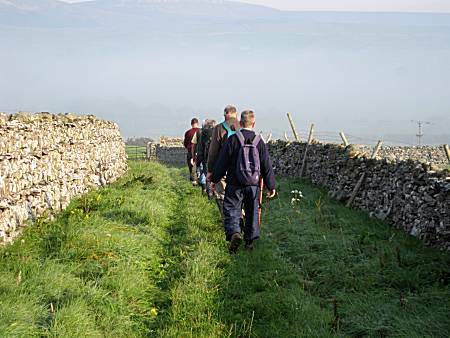 The walkers became concerned when they could see in the distance a vast bank of cloud and mist, but they were not frightened. 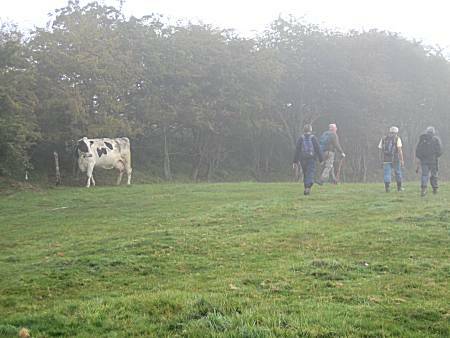 The swirling mist descended and they found their passage blocked by a menacing local, who forbade them to go any further!! Paul was very angry by this unwelcome development and could not hide his anger. 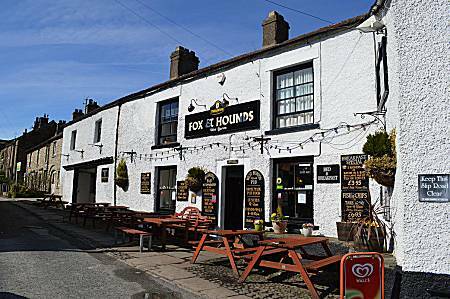 The walkers returned to negotiate with the local, where it transpired that she and her family had lost the "Fox & Hounds" in West Burton. 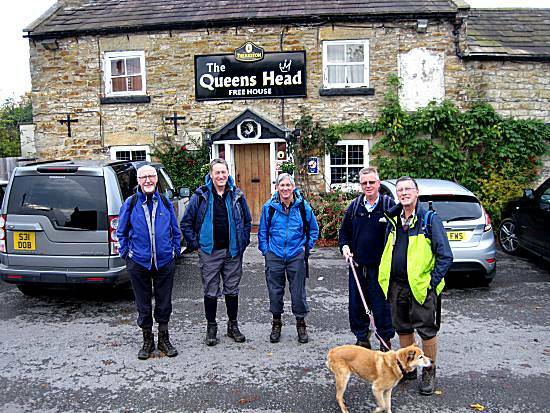 It was agreed that in return for directions they would be allowed to pass and the local stepped aside allowing the walkers to continue. However, they secretly knew that to find this establishment would be a tough challenge, but they fully intended to keep their promise. 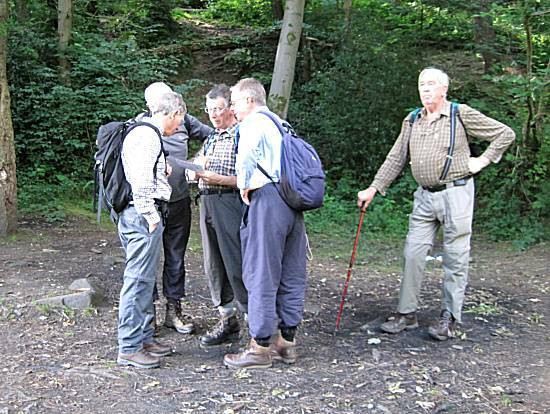 Much discussion and confusion was witnessed, but the walkers knew that they must head uphill. 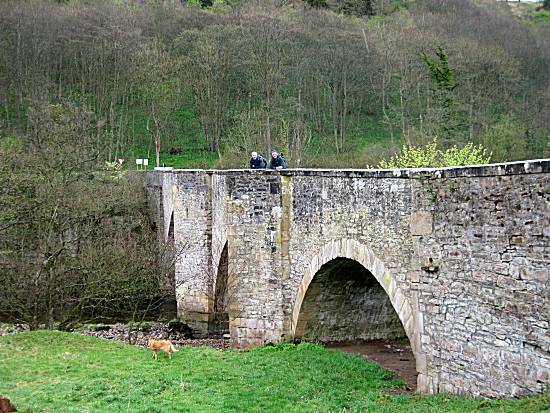 Soon the walkers were hopelessly lost and even further bridges could not provide sufficient strength for them to continue. 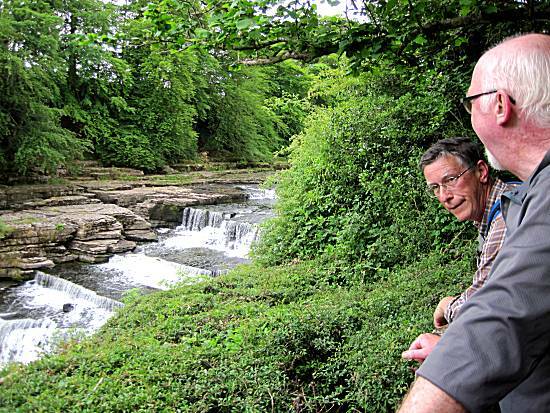 Ed was convinced that he could see the pub, but the fast flowing river remained in their way. 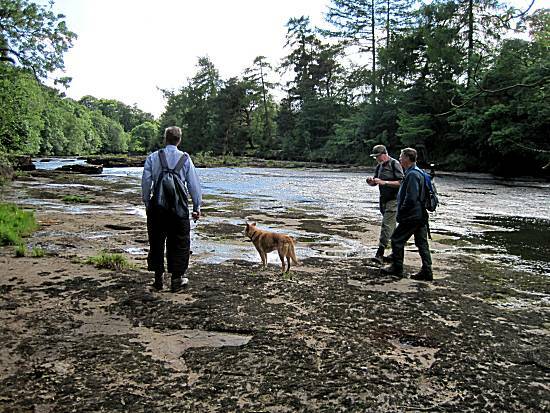 After they sharing their Pork Pie rations, the intrepid walkers crossed the river, leaping from rock to rock. 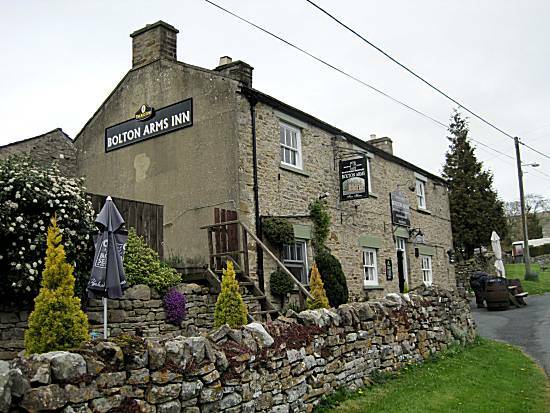 The walkers rejoiced on locating the Fox & Hounds in West Burton, knowing that the mission had been successful. 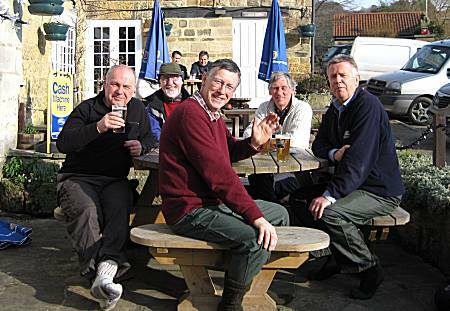 The walkers enjoyed sufficient quantities of Black Sheep Ale, till the barrel ran dry. 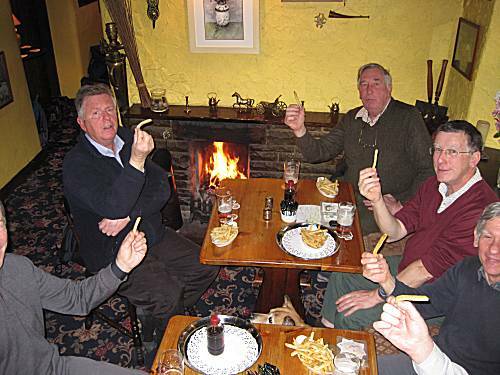 Ron cunningly negotiated a 'Chip Deal' with the owners. 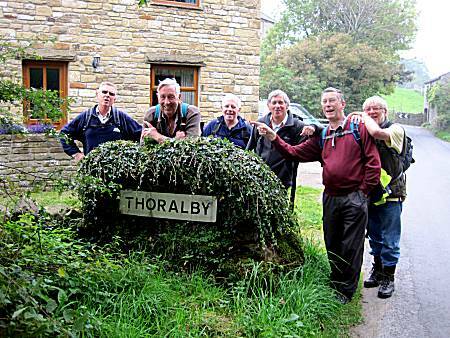 The walkers arrived back in Thoralby in high spirits, knowing that another successful mission had been achieved. 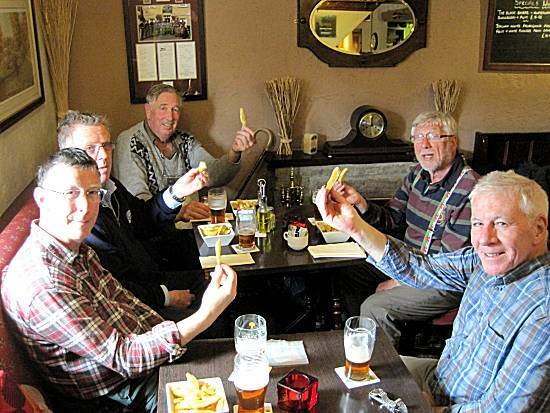 Chip Score: Good quality chips, although slightly costly. 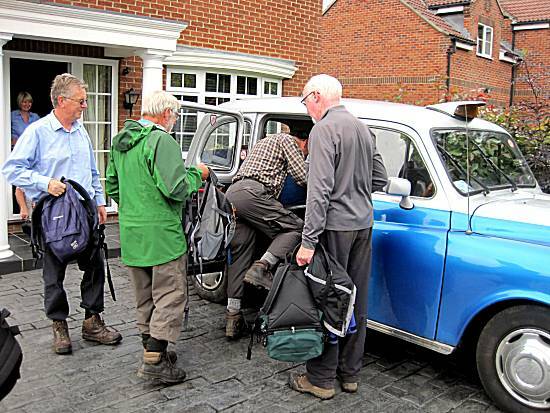 The six walkers arrived at the car park in misty conditions, but ready for a challenging walk of discovery, after they had consumed Ron's delicious Bacon, Sausage and Egg butties. 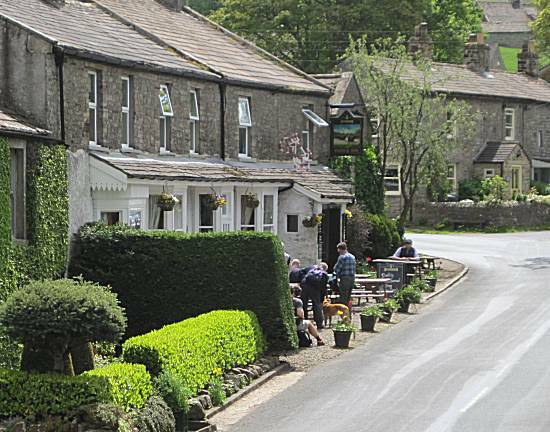 They set off in a southerly direction to pass near to Thornton Steward, before cunningly doubling back to the North, to minimise any stress to the locals. 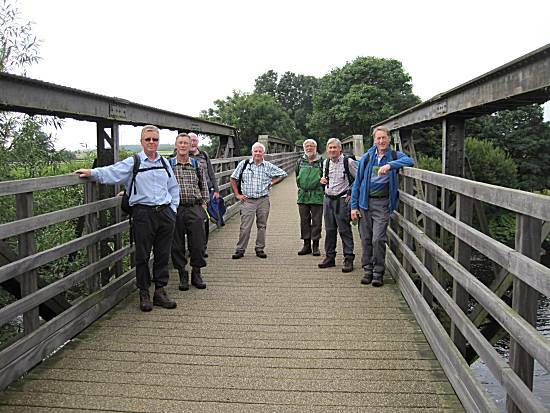 Paul (their leader) advised that there would be few, if any, bridges on this walk and the others were mortified!!!!! Where would they be able to gather their strength? 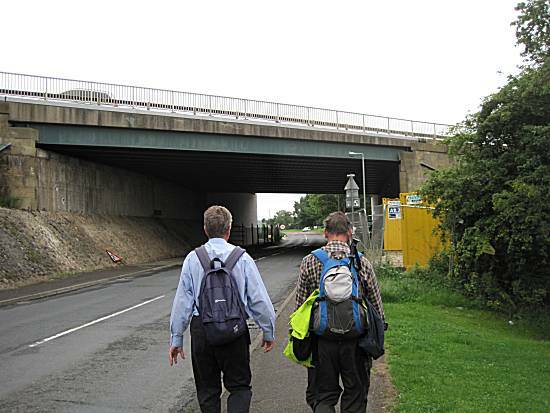 Secretly they vowed to track down and catalogue all the bridges in the area and prove to Paul that he was wrong!!! 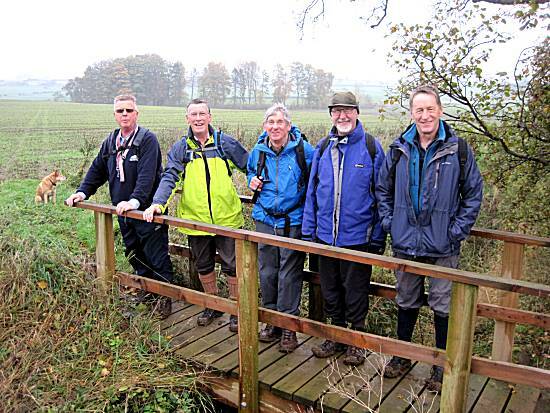 The local farmers, keen for the walkers to succeed in their bridge locating mission, allowed them to cross their giant ploughed fields. 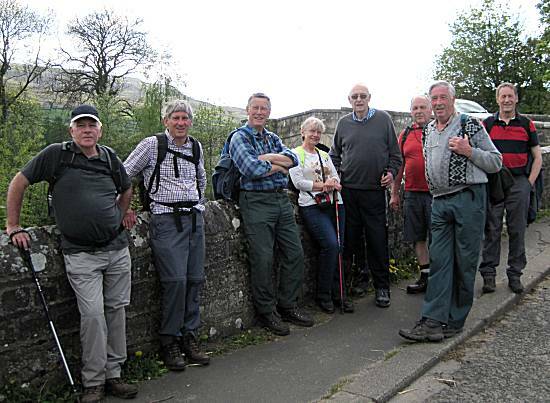 Contrary to Health and Safety advise, the walkers posed for photos on the express line to Leyburn. No incidents occurred. 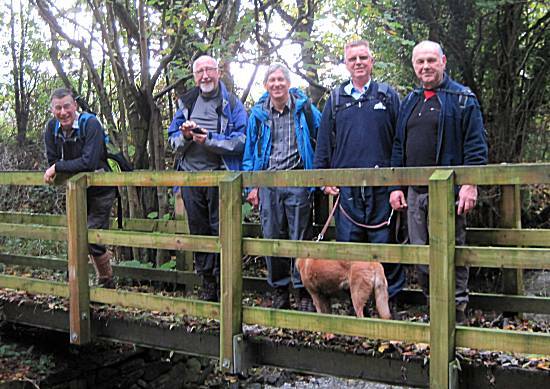 Bridges 3, 4 & 5 presented no problems for the intrepid walkers. 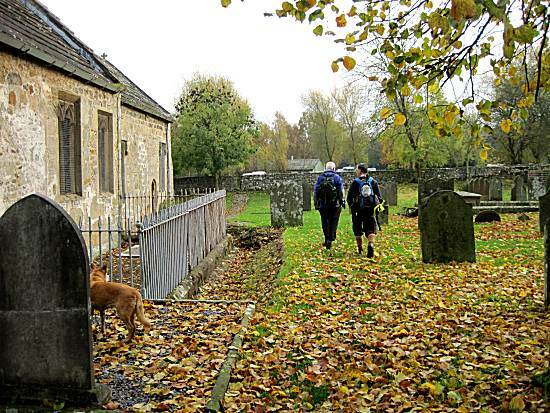 The exhausted walkers sort refuge at St Andrews Church, Finghall to share their pork pie rations. 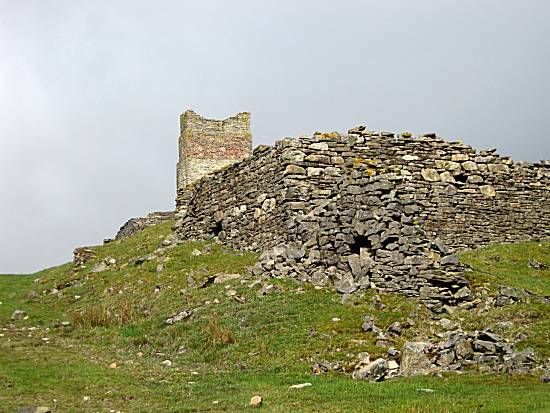 It was built mid 12th Century, c1200 constructed of sandstone rubble, stone slate roof. 3-bay nave with north aisle and west porch, 3-bay chancel with north vestry and heating chamber. 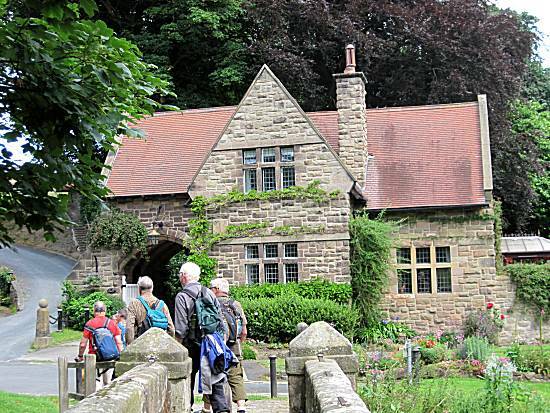 The porch was constructed of a coursed stone square doorway with timber lintel, ashlar coping at left end. In west wall, chamfered single-light window. Inside porch, stone bench along west wall. On the outside of west wall of church, 7 ashlar steps up to board door to former gallery, and plank door in ashlar surround with straight tooling; chamfered single-light west window flanked by C20 triangular buttresses. The Nave, south side C19 window of 2 trefoiled lights; blocked doorway of c1140, with 2 windows of 2 trefoiled lights; ashlar coping, double bellcote on east gable. North aisle, from east: C19 window of 2 cinquefoiled lights; chamfered single-light window; blocked quoined segmental-arched doorway; stepped buttress. Double-chamfered single-light west window. Chancel: C14. 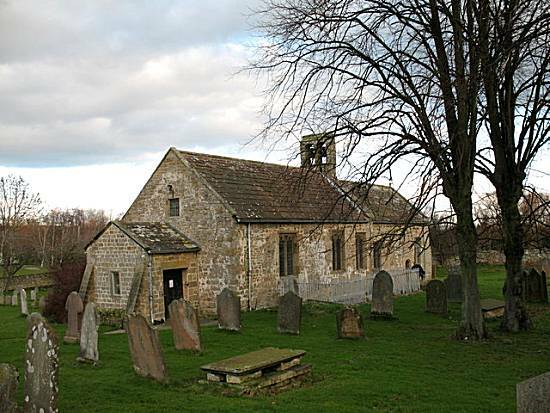 South side, from west: late C14 window of 2 trefoiled lights with hoodmould with head stops; blocked single-light window; C19 priest's doorway; late C14 window of 2 trefoiled lights with hoodmould with large head stops; ashlar coping and gable cross to east. East end has end buttresses and mid C14 three-light window with reticulated tracery, and hoodmould with head stops. Vestry and heating chamber: single-light east vestry window with voussoired segmental arch; C19 window with segmental-arched head and board door in quoined surround to heating chamber; C19 chimney rising up to north of chancel wall. Interior: 3-bay north arcade possibly of c1200, with round pillars on bases, octagonal abaci and triple-chamfered round arches. Mid C14 chancel arch of 1 order, slightly chamfered with double-curved moulding on north respond capital. C13 octagonal font, tapering as an inverted pyramid, onto a circular base with roll moulding; C17 wooden pyramidal cover with finial. C17 pulpit. Dado panelling of C18 and C19 dates. Communion boards on east wall of north aisle. At north end of altar rail, up against wall, C14 grave cover with foliate cross with branches on stem, also a pair of sheep shears and a book. In west wall, stone with circular panel containing a floriate cross-head. In and near chancel south wall, fragments of C9 sculpture, including part of cross-head and part of crucifixion with expanded arms and knot-work. In south-east chancel window, fragments of medieval stained glass. C17 altar table near priest's door. Ella checked that the suspicious pipe visible from this side, did not negate this being an official bridge No 6, but she declared it genuine. 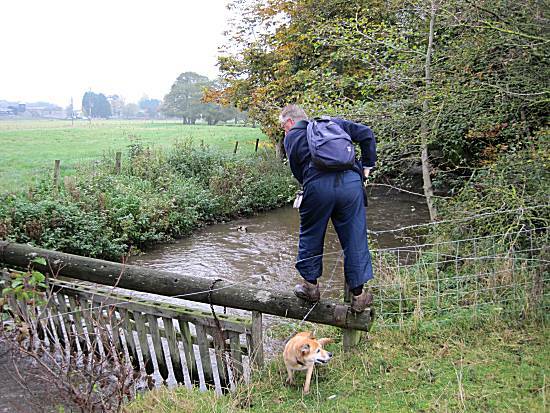 Ron was forced to cross the treacherous Bridge No 8, before it could be counted as an official bridge. Ella declared it a bridge. 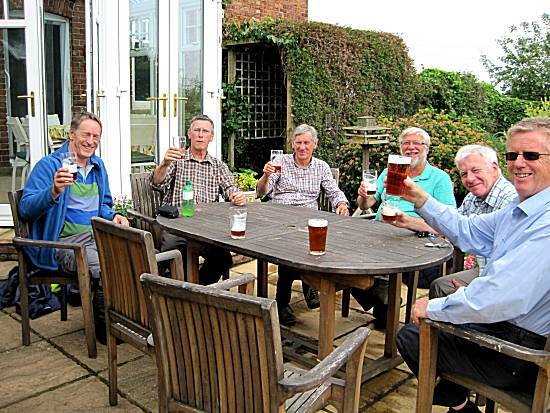 In the warm conditions, the walkers consumed their first pint in the beer garden. 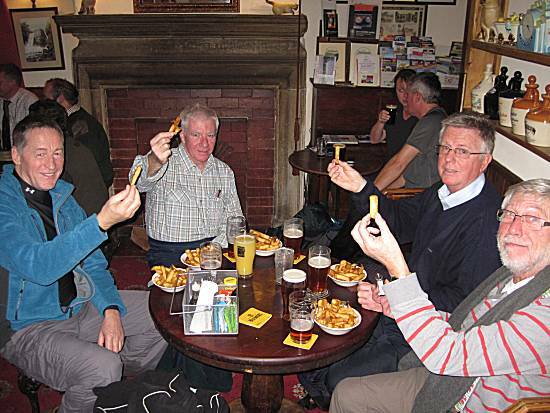 Chip Score: Good quality chips, reasonable price. 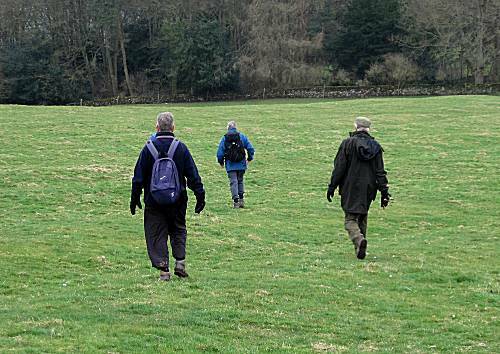 Just five walkers arrived in the centre of East Witton quickly devouring Ron's excellent bacon, sausage and egg butties in an attempt to hide their fear of a difficult walk in potentially life threatening weather conditions. 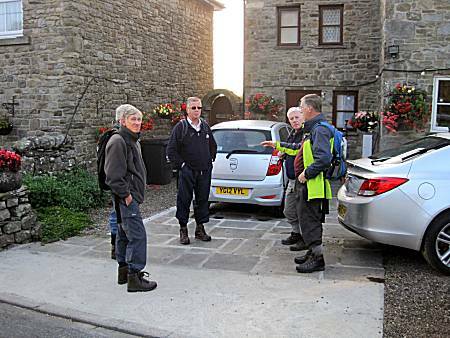 Cliff called by on the way to a shoot to wish the walkers well before they set off in a south easterly direction towards Ellingstring. 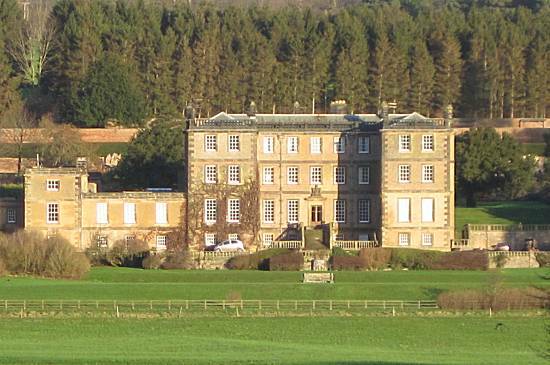 The local police had requested the assistance of the walkers with the near impossible task of locating Danby Hall, which had been reported stolen just the day before. 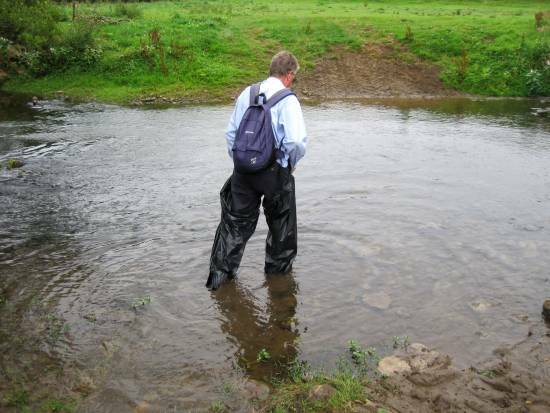 A DISASTER OCCURRED almost immediately, when Jon realised that he must have dropped his coat and not wishing to delay the progress of the walk, elected to retrace his footsteps. 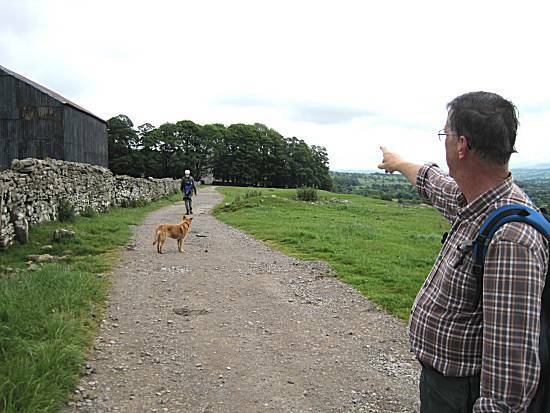 Cunningly the walkers agreed that afterwards he should take a quicker road route and arranged to meet where the footpath joined the Masham Road adjacent to North Wood. 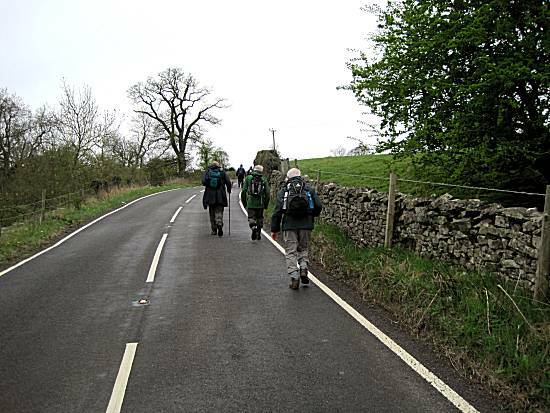 As the walkers approached the Masham Road, they were relieved to see Jon waiting for them in a secluded location, so as to not give the game away to others. 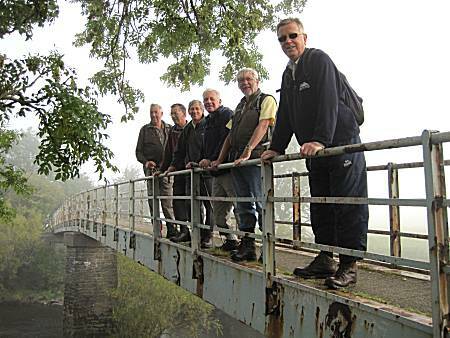 Ed remained impatient, anxious to locate the missing Danby Hall, as the others enjoyed the powers of a giant bridge. 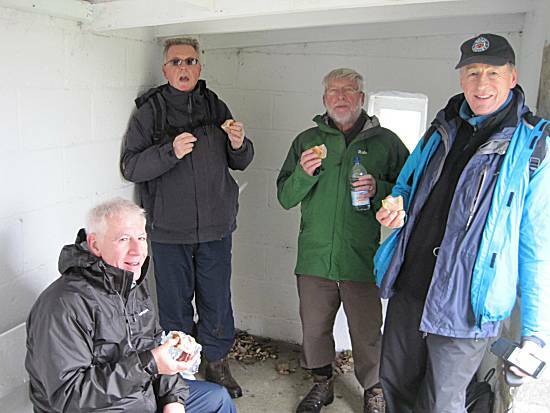 The walkers were grateful to the residents of Thornton Steward who had constructed a special building for them to shelter from the driving rain, whilst they enjoyed their Pork Pie rations. 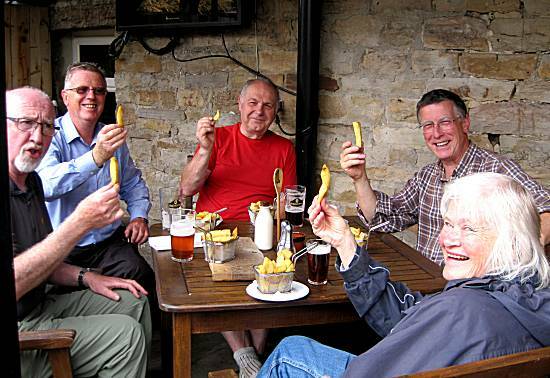 Chip Score: Excellent chips at a reasonable price. 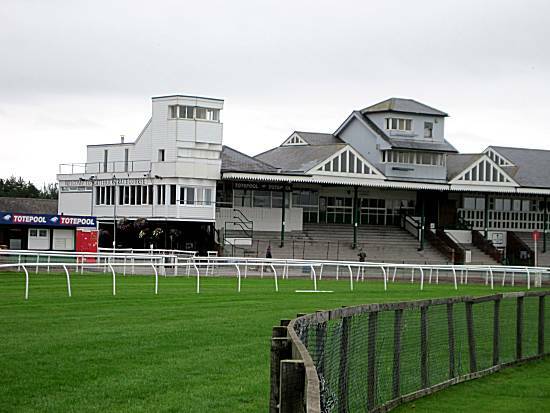 Weather: Weather deteriorated during the day with gales and driving rain. 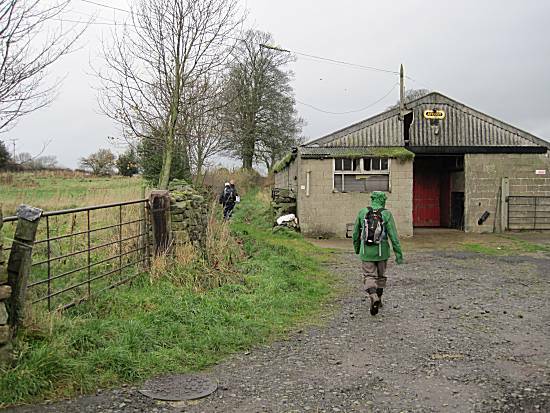 Ten walkers arrived at the usual lay-by south of Leyburn, ready to consume Ron's delicious, bacon, sausage and egg butties, before they set off in the wet conditions. 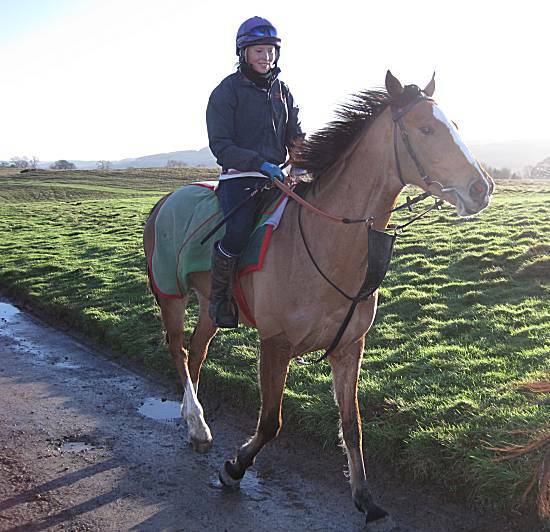 The weather looked good for the day with a promise of winter sunshine, although the fields were saturated from the recent heavy rain. 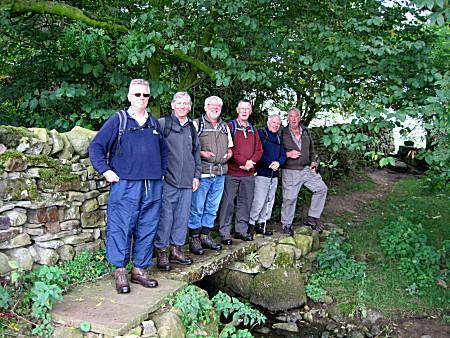 Arrival at Wensley was marked by a group photo on a bridge, where the walkers welcomed the additional energy gained. 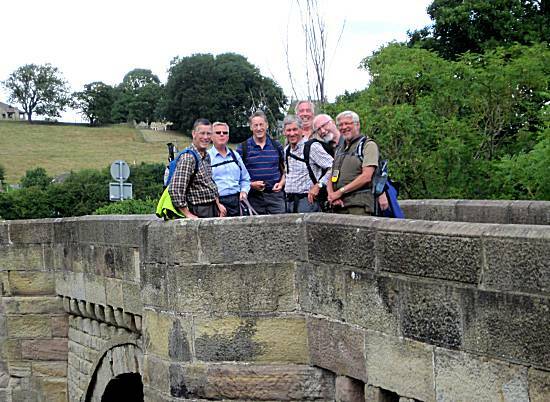 The walkers reach Lords Bridge, but know that no pie will be available until lunchtime!! 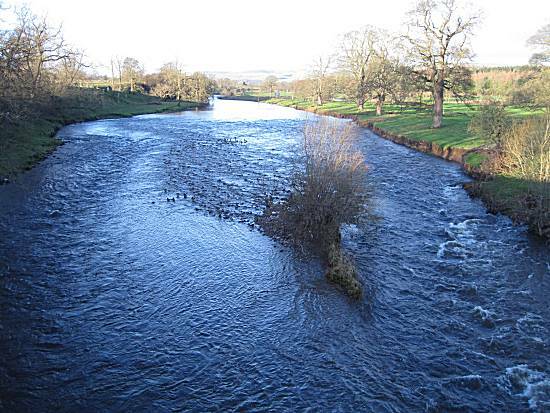 Sight of Bolton Hall in the distance from Lords Bridge, brought back fond memories!! 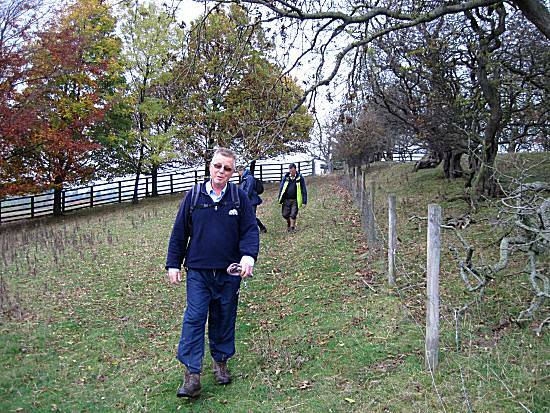 Cliff instructed the walkers to use a cunning shortcut to the 'gallops' where quickly young fillies were seen flocking towards the walkers!! 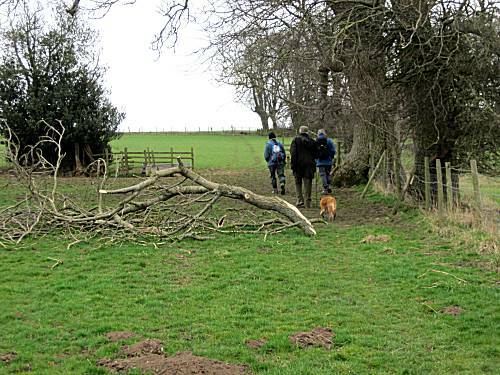 Within sight of the lunchtime stop at the Coverbridge Inn, the walkers found their passage blocked by a fallen tree. Will the walkers starve through lack of pie? 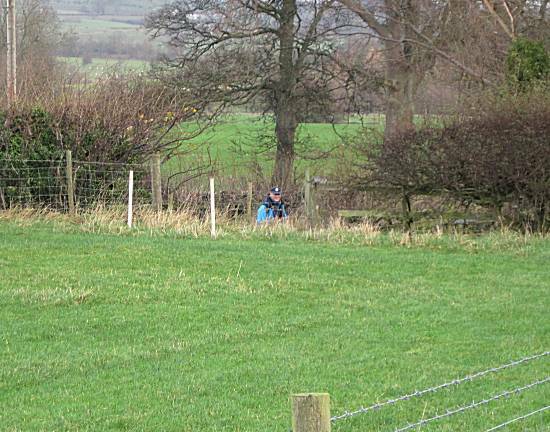 Cunningly Robin, showing little fear, stepped over the dangerous high voltage electric fence, thus opening a route to the pub. 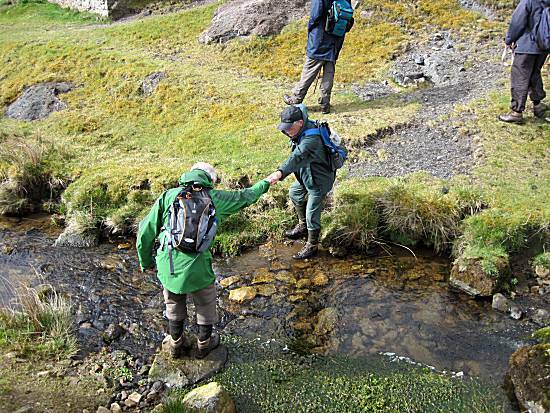 The other walkers were grateful for this act of kindness and proceeded with much haste. 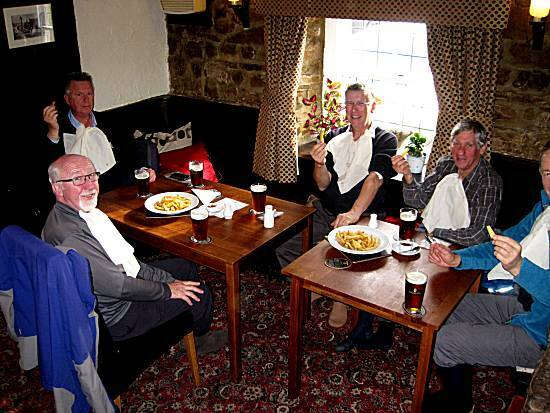 Much joviality was witnessed in the Coverbridge Inn that afternoon, as not one, but two game pies were consumed, together with giant bowls of freshly prepared chips. Michael later joined the walkers, for the community singing. 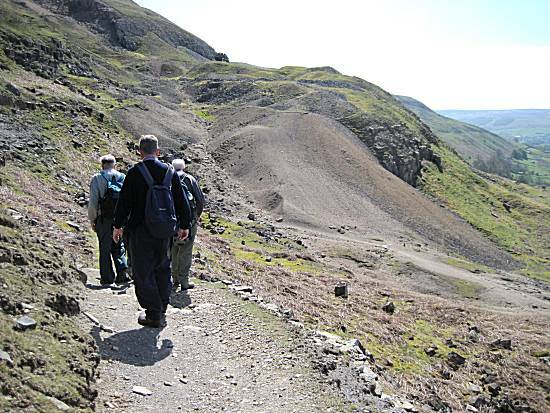 Weather: A fine walking day, with some sunshine and clear skies. Although very wet underfoot.